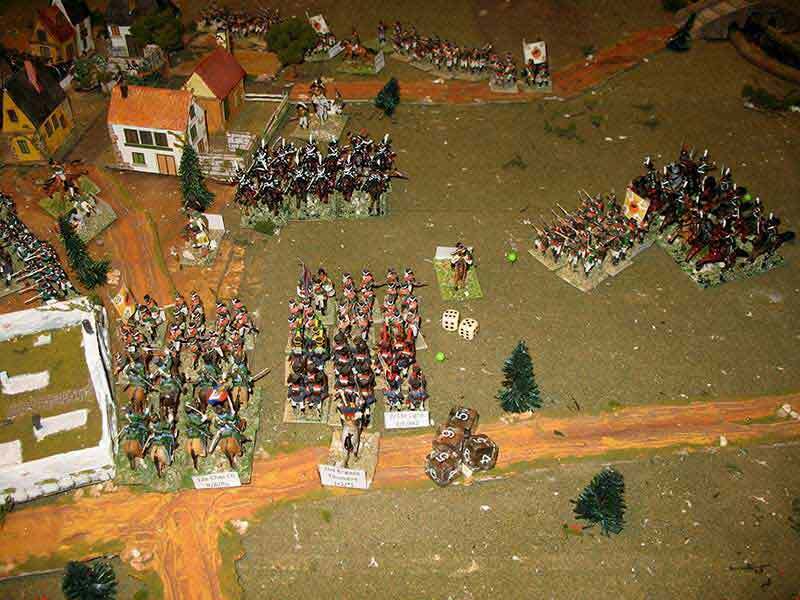 The random disposition of the Russian units and the delay in the apparition of French units, made these plans impossible to carry on for both generals. 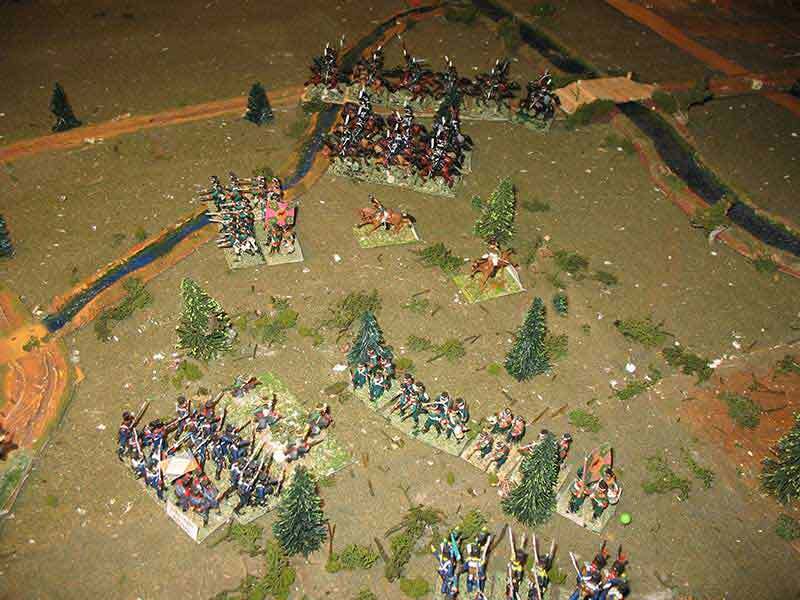 The actual Russian forces used were 14 battalions/5 regiments (3+)/2 batteries/3 cossacks (46 moral points), so the Russian losses were 30%. 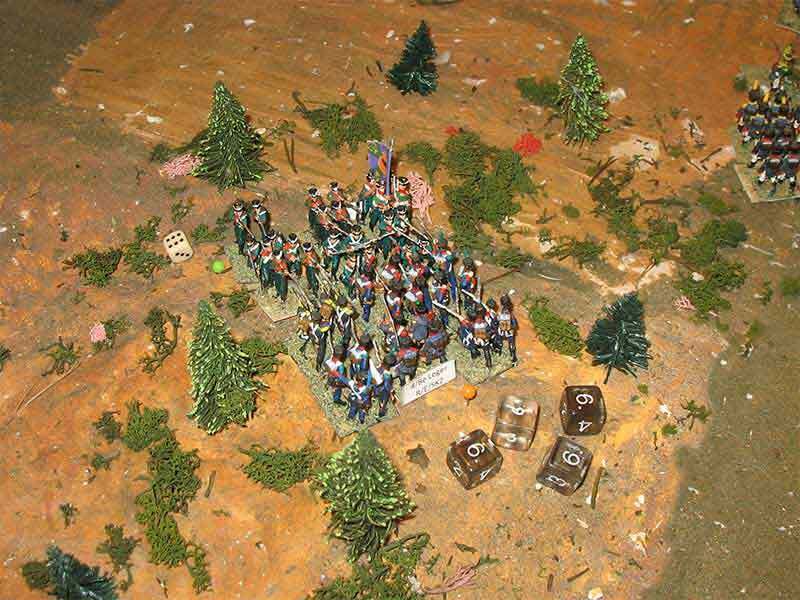 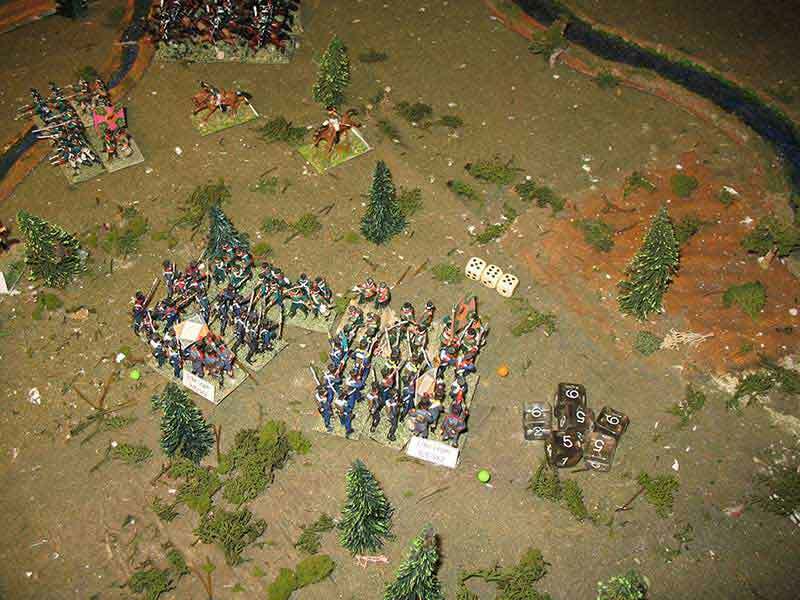 However, if the total Russian forces are taken into account (considering that un-used Russian have successfully passed along the battlefield), 19 battalions/6 regiments/(4+)/5 batteries/8 cossacks (67 moral points), the losses amount only to 21%. 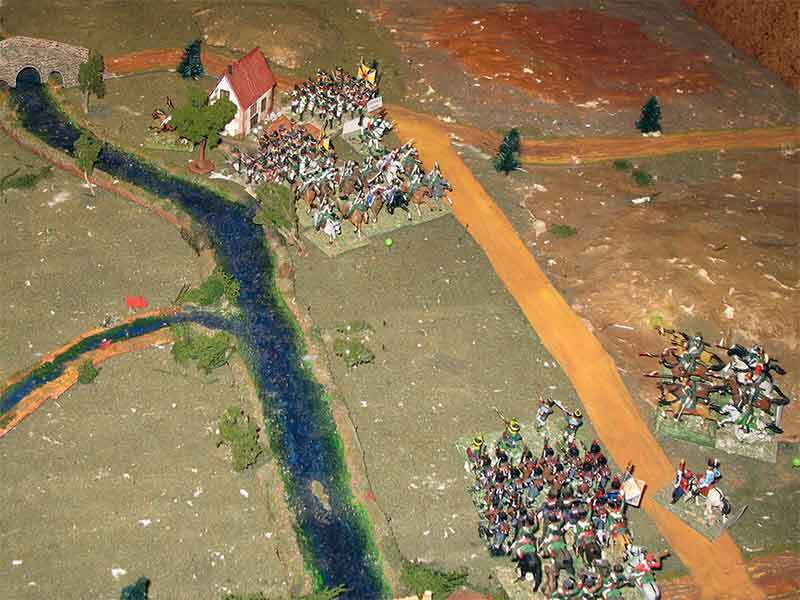 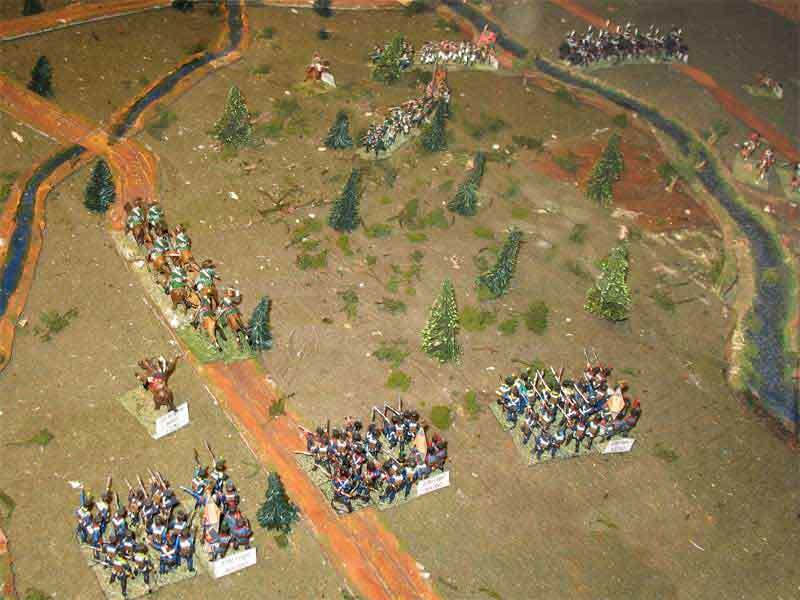 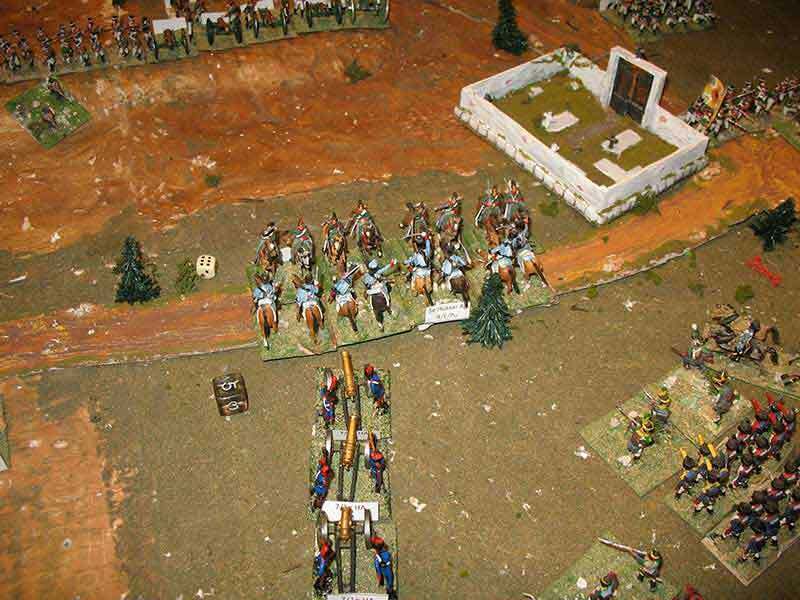 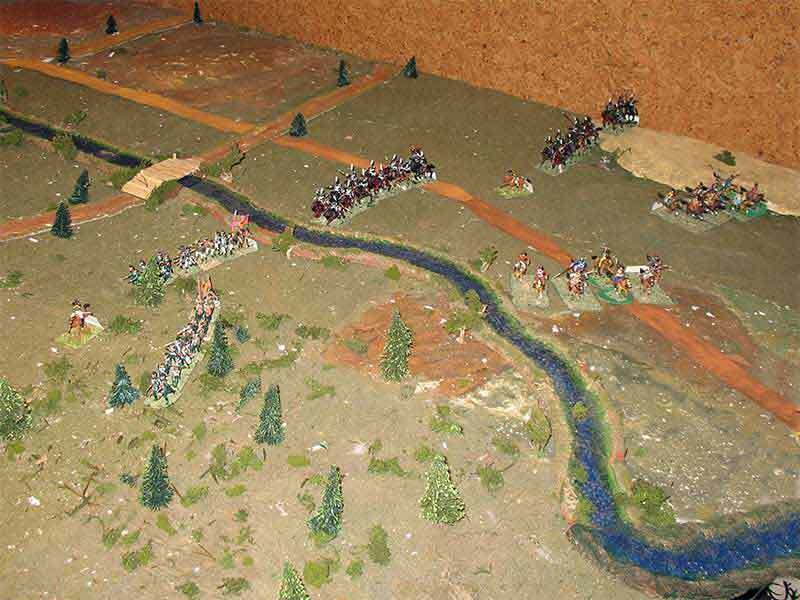 The battlefield was, in theory, dominated by the bridges located in the center and eastern zone, which could make possible the stopping of Russian columns or even their break into two parts, out of range of each other. 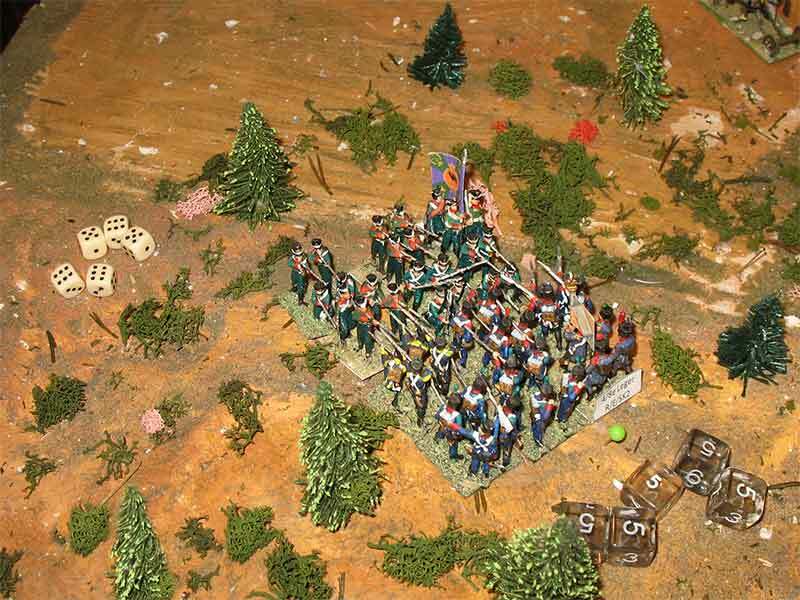 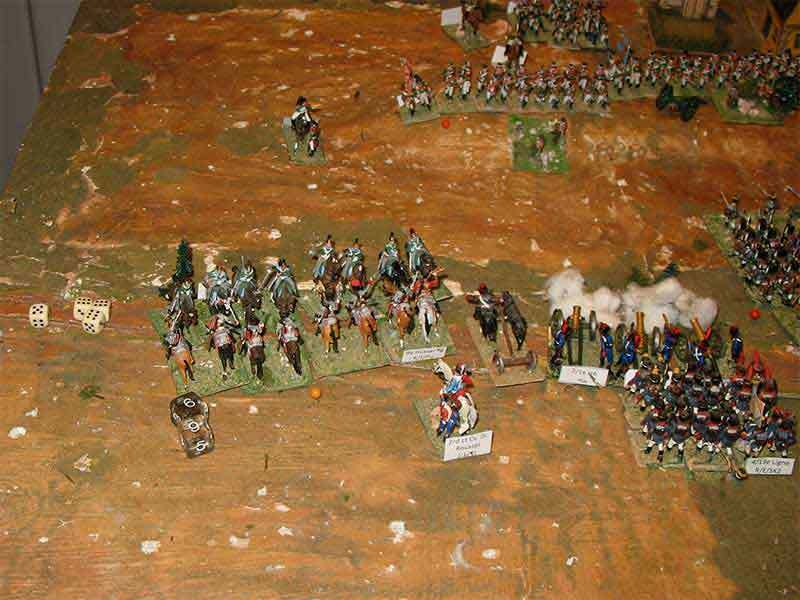 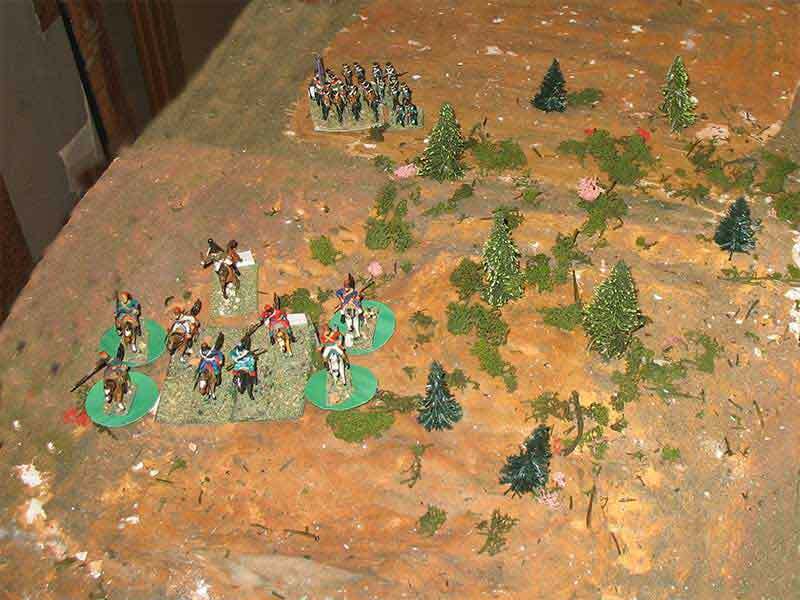 However, the French vanguard lost a precious time, which turned out to be unrecoverable, cleaning the central wood of enemies, so only a lone lancer regiment was available to try the taking of the strategic central features. 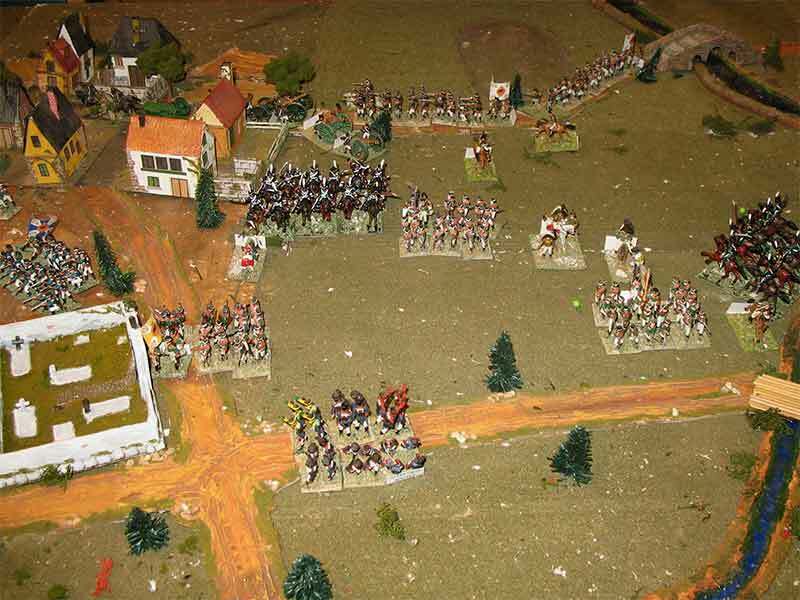 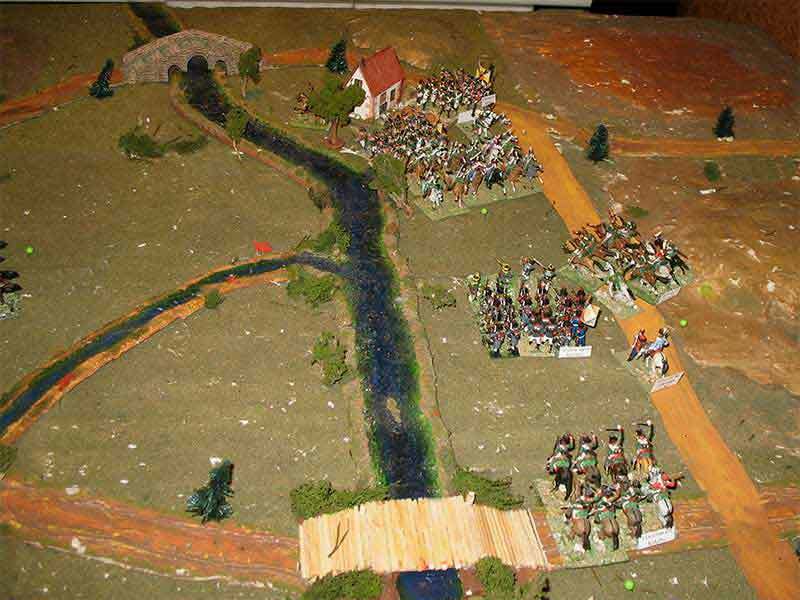 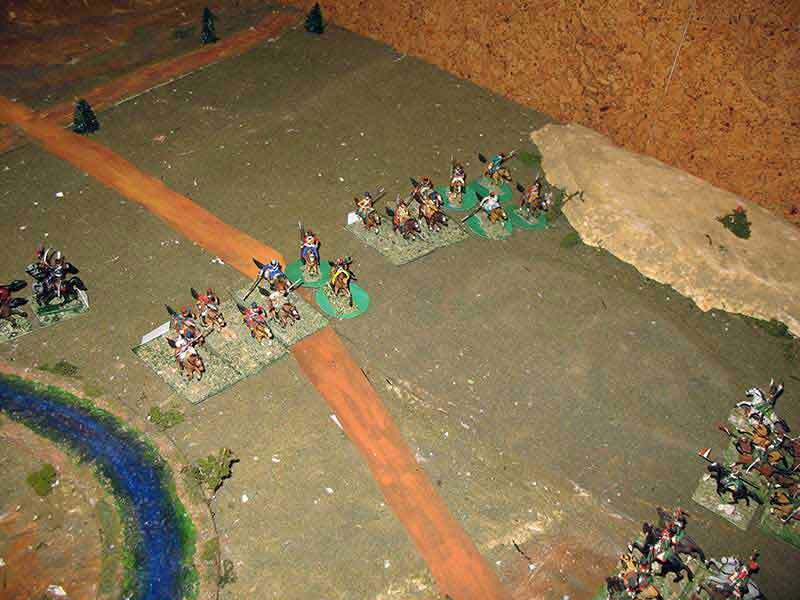 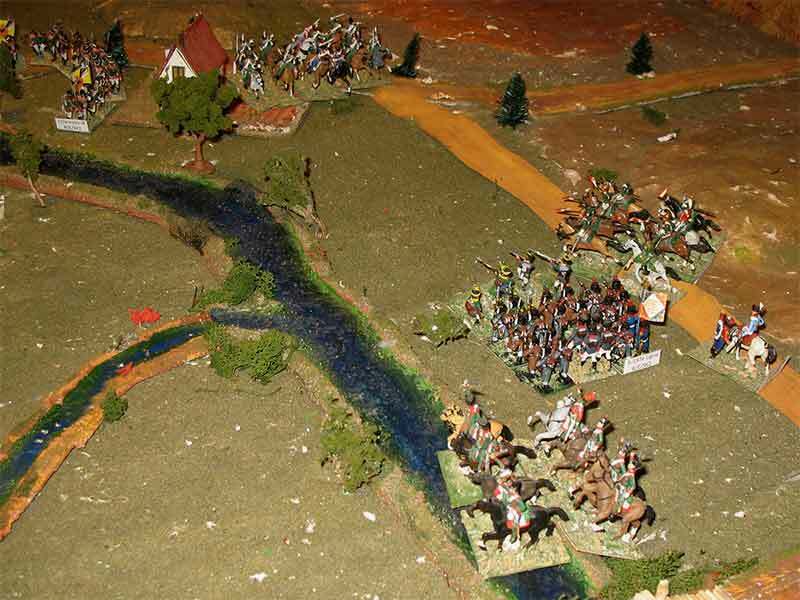 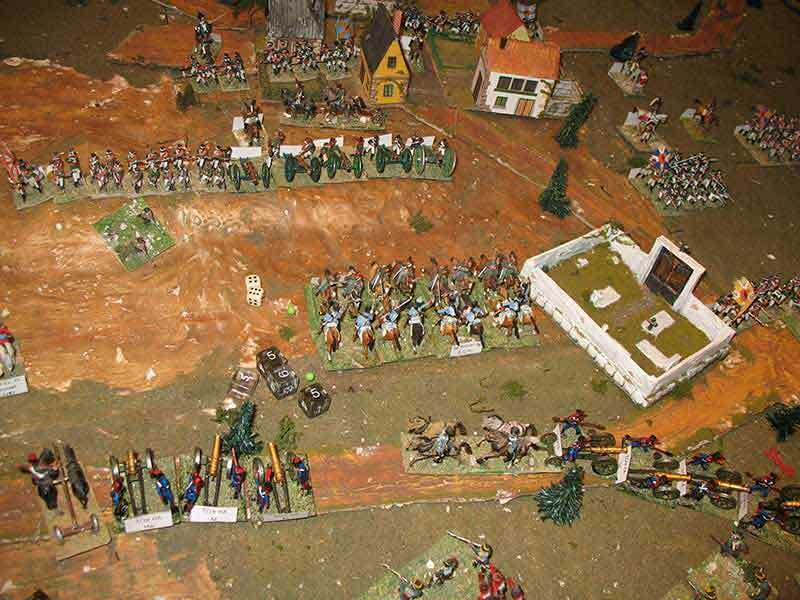 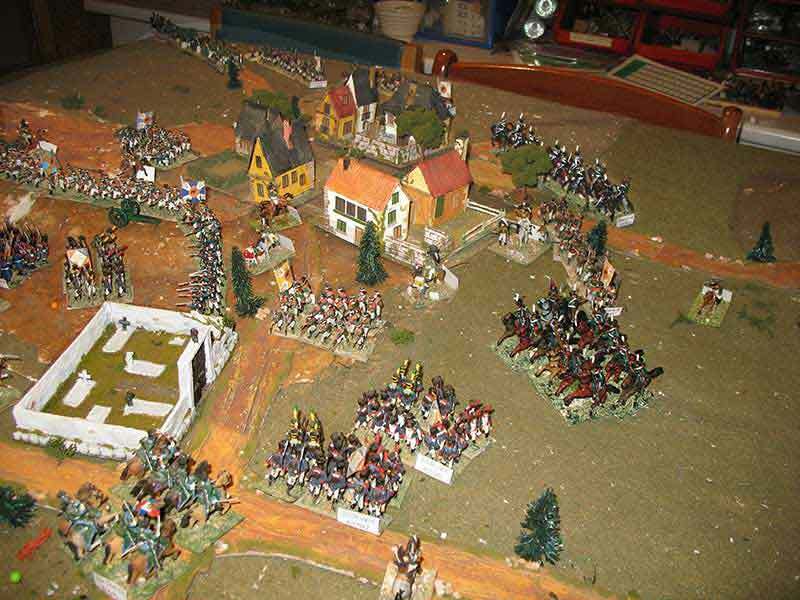 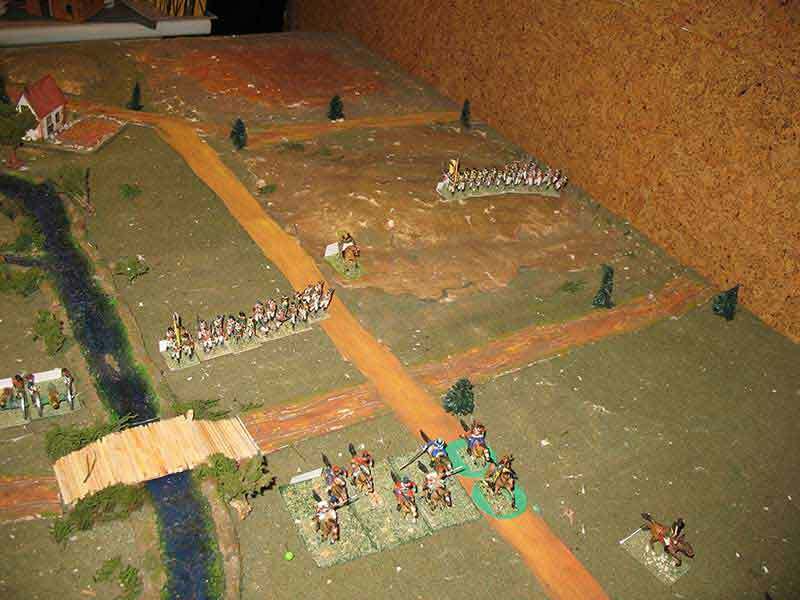 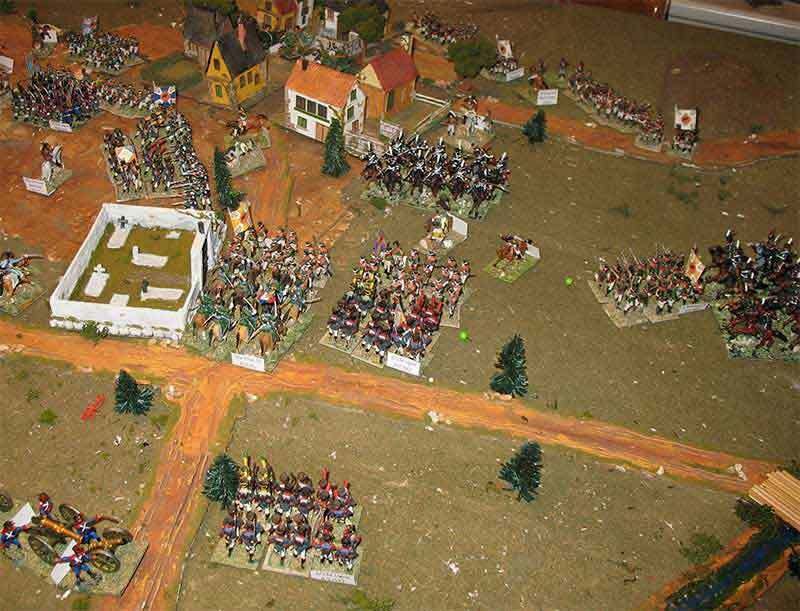 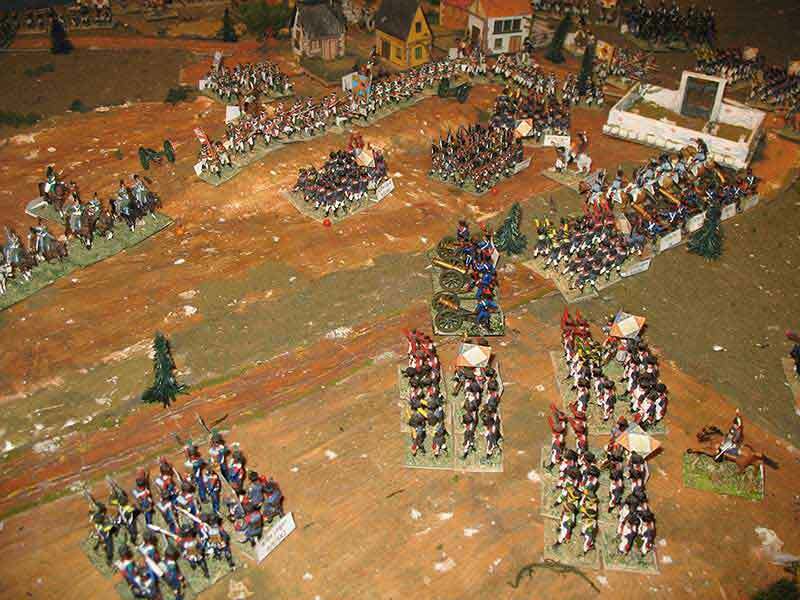 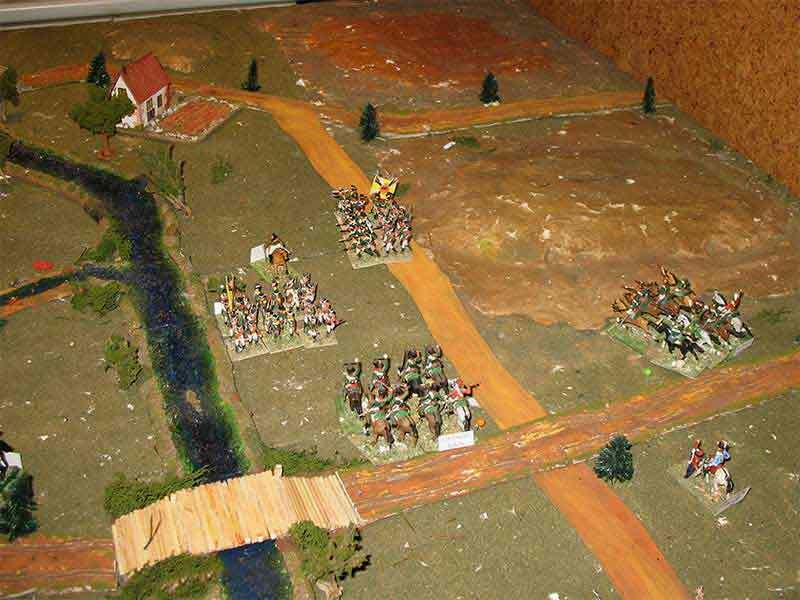 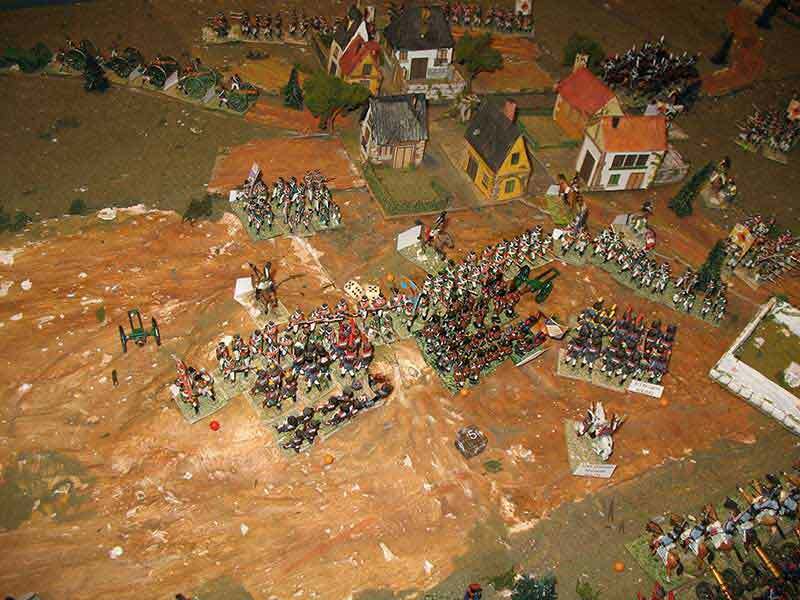 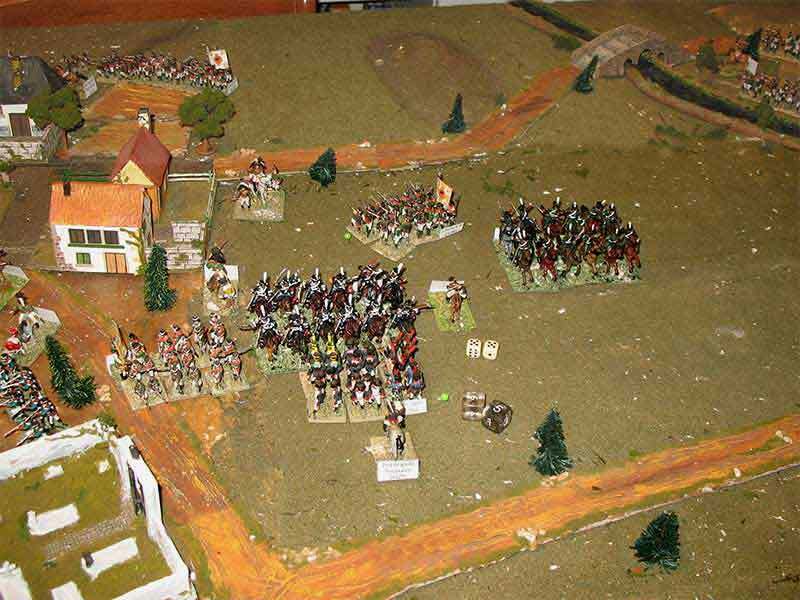 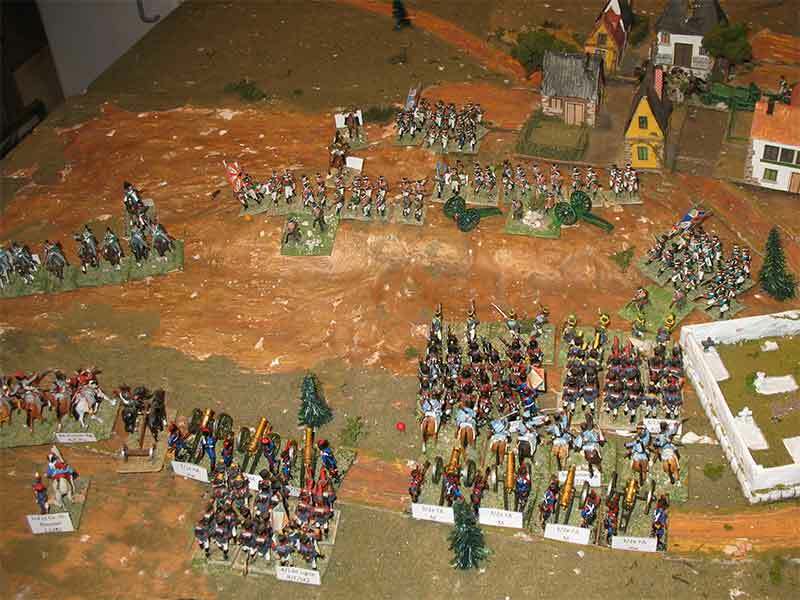 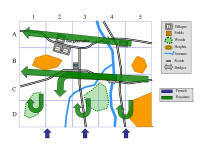 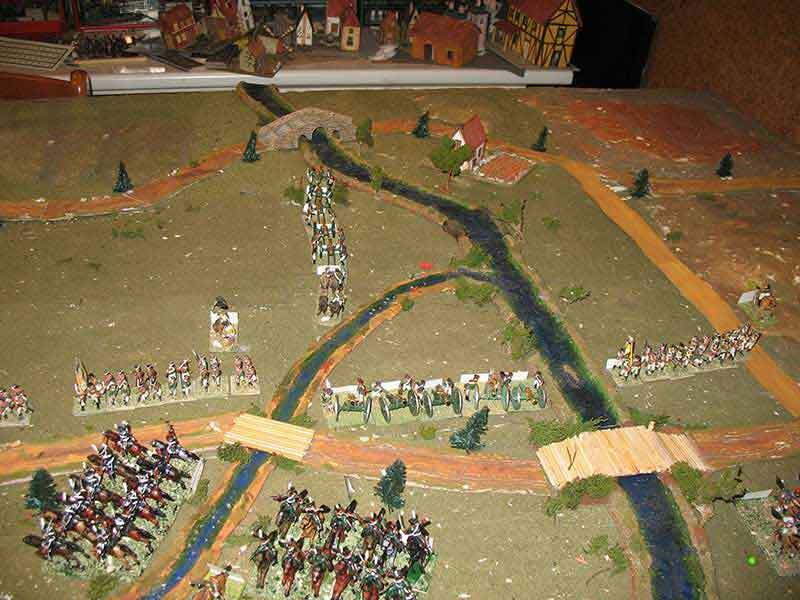 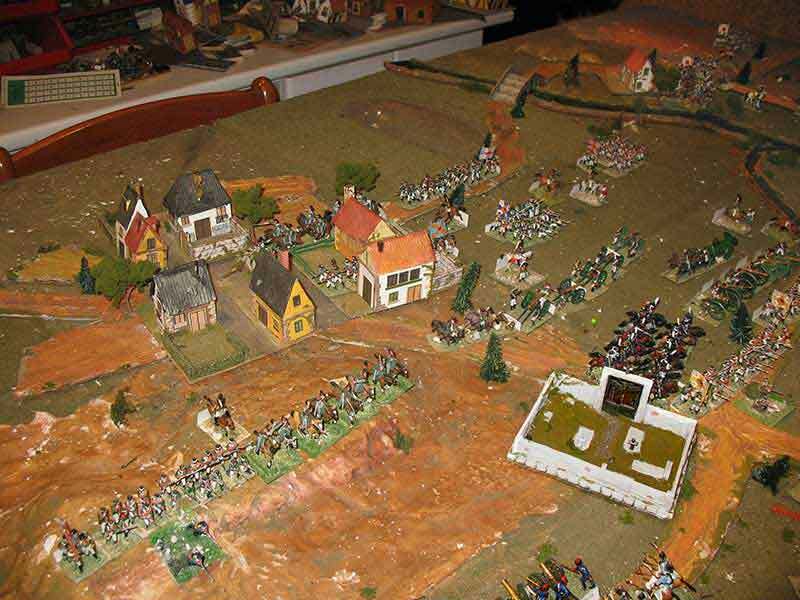 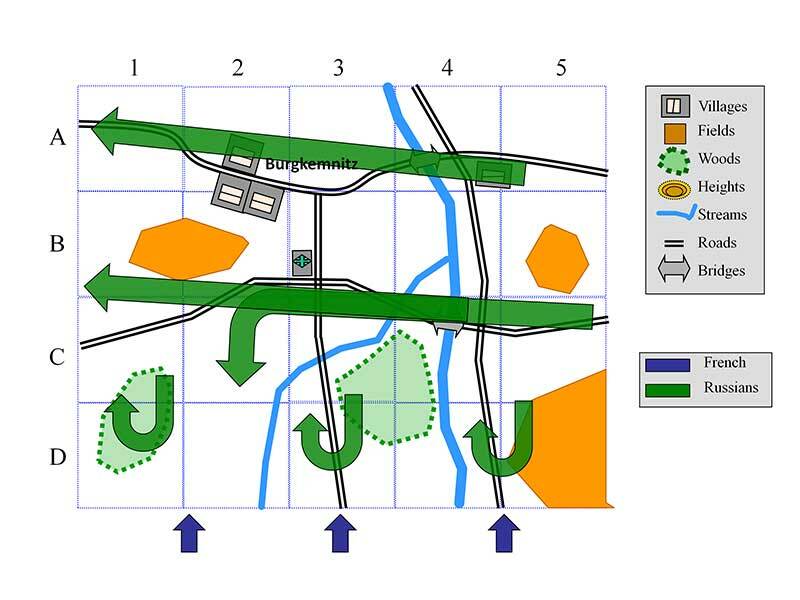 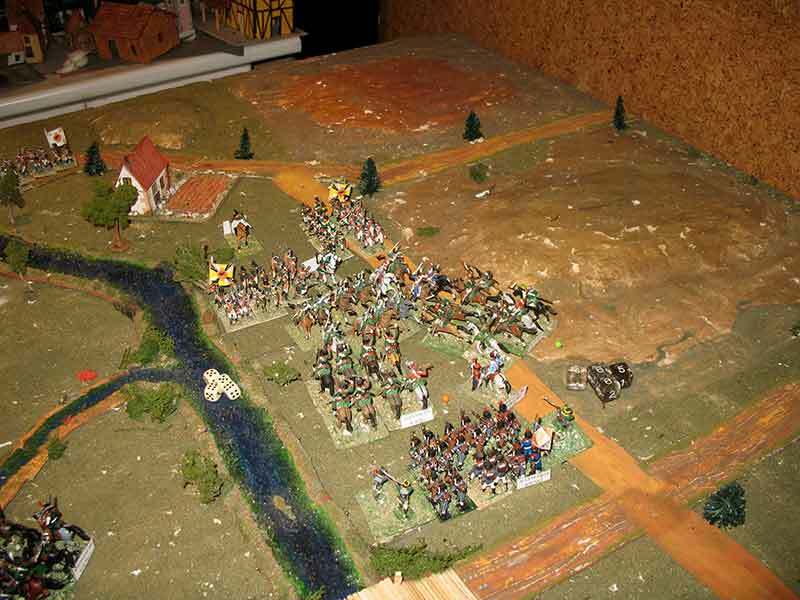 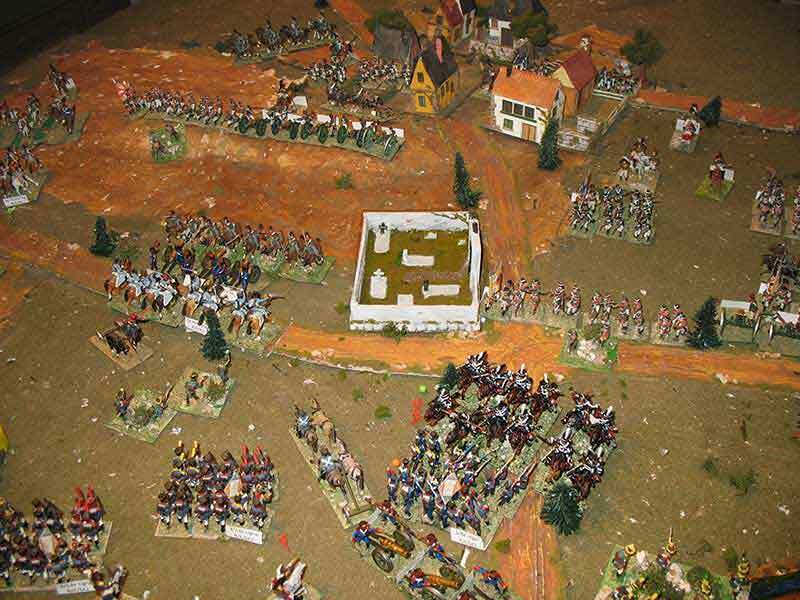 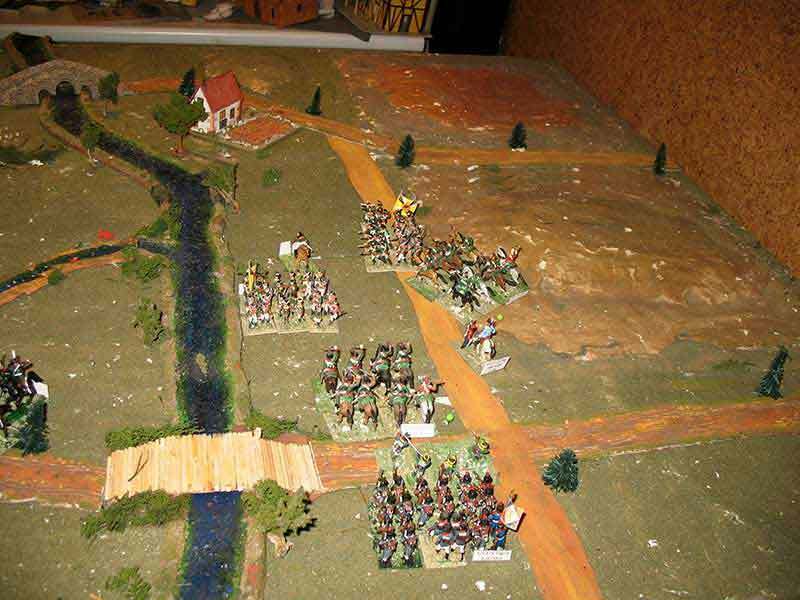 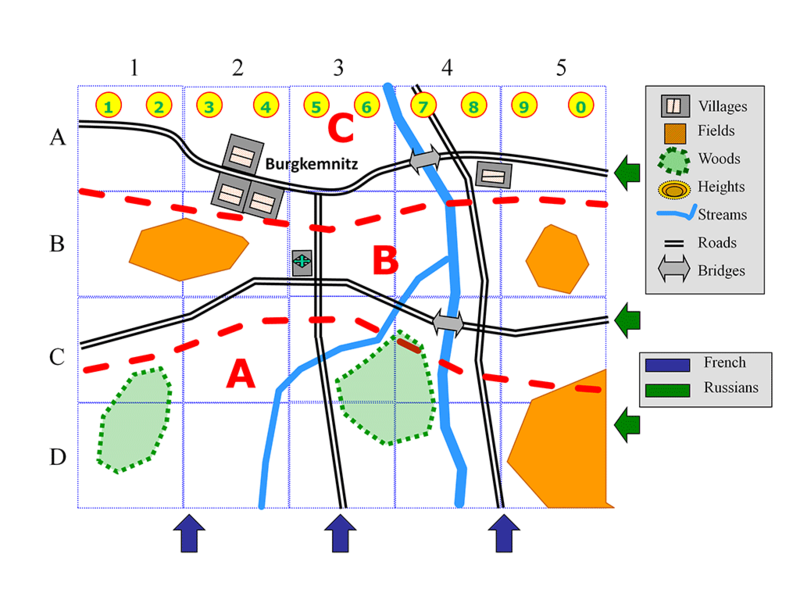 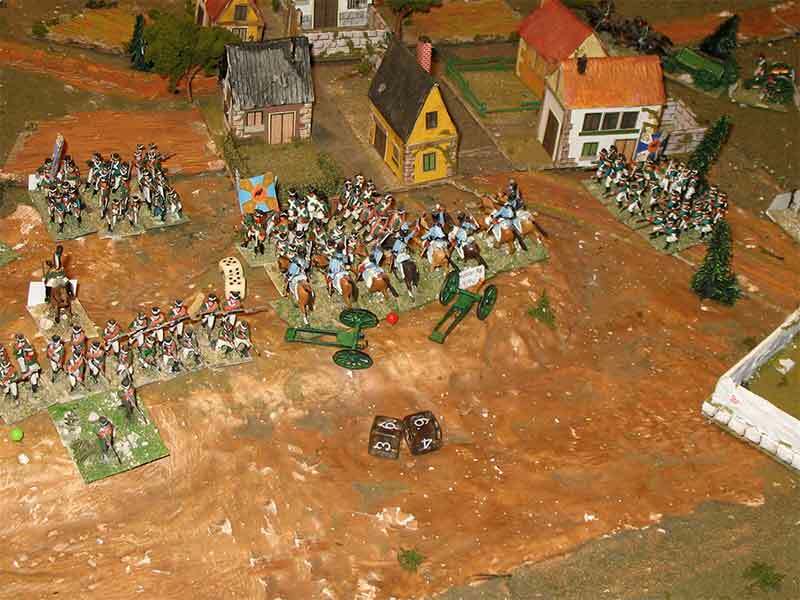 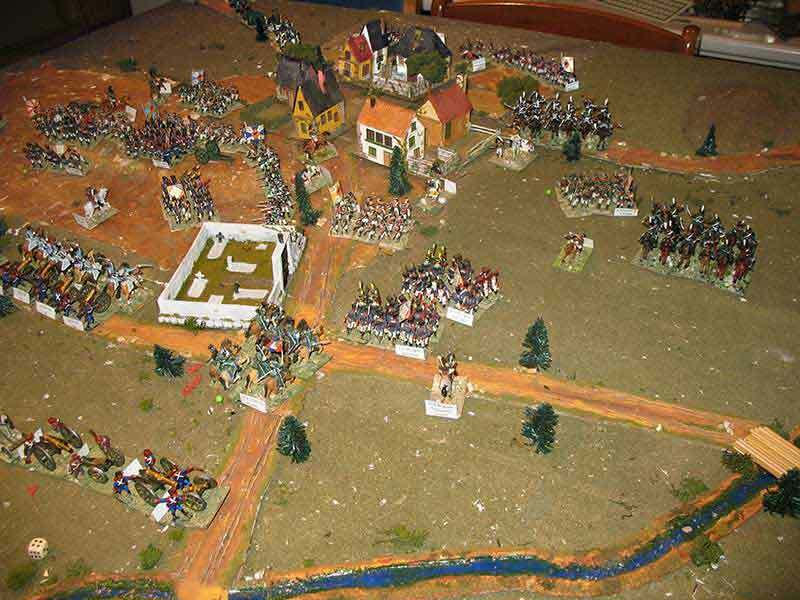 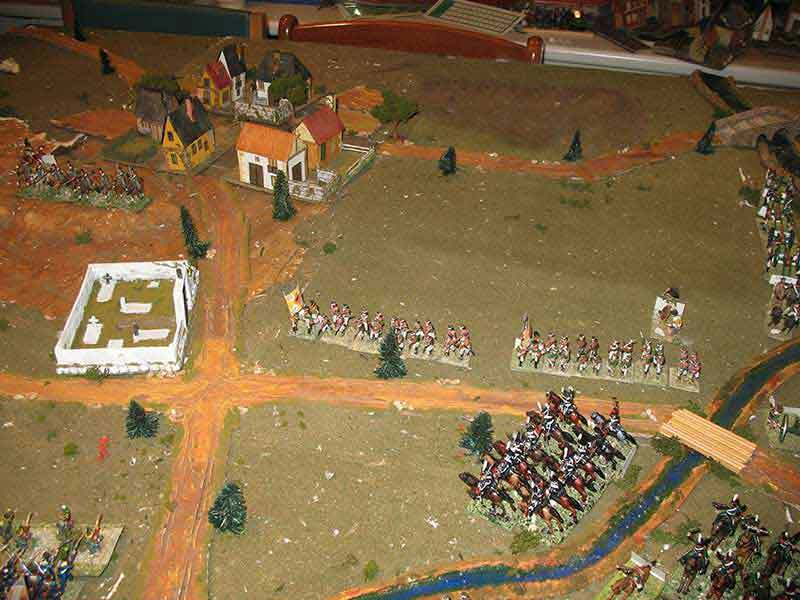 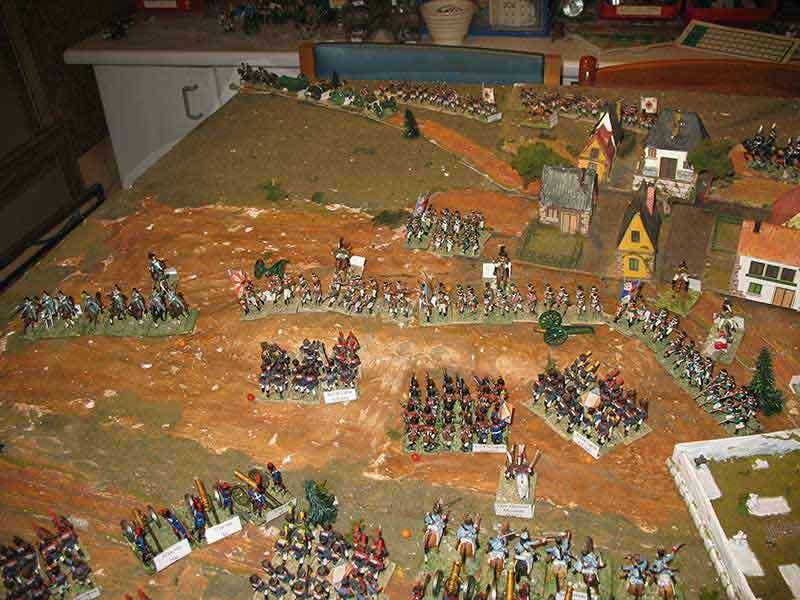 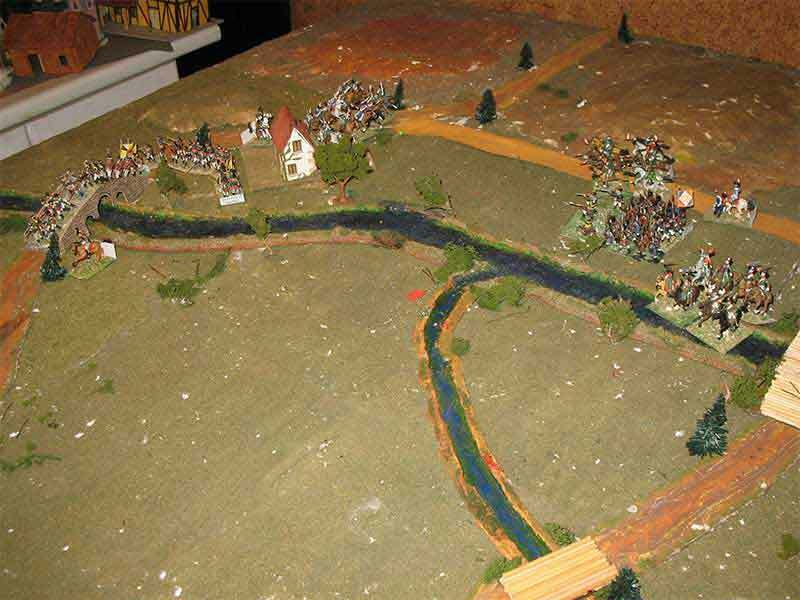 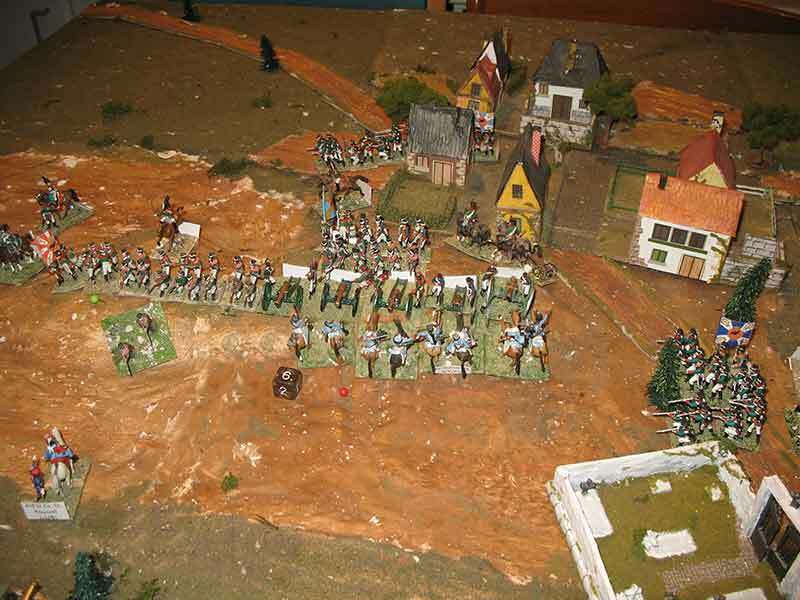 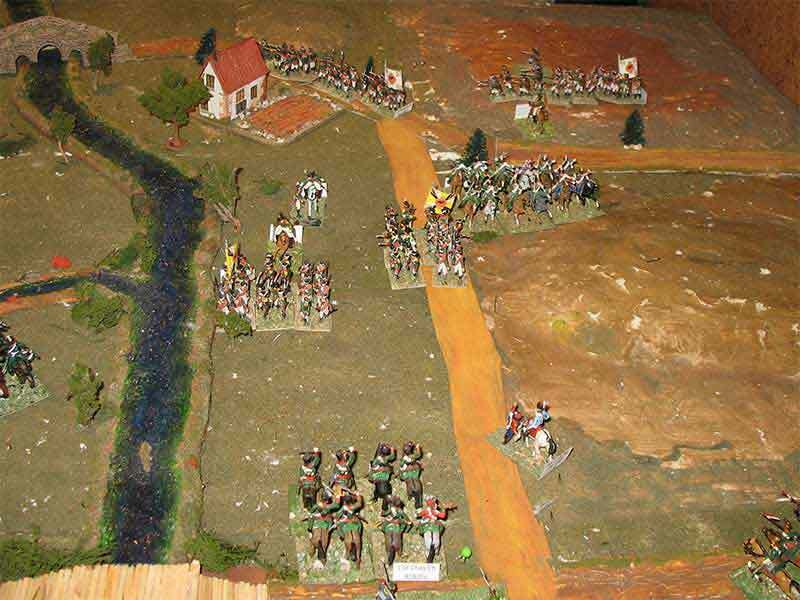 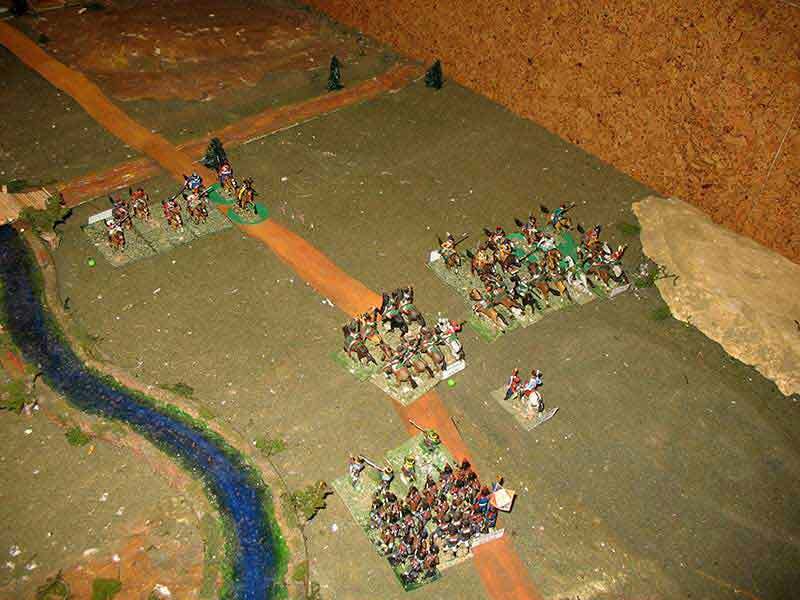 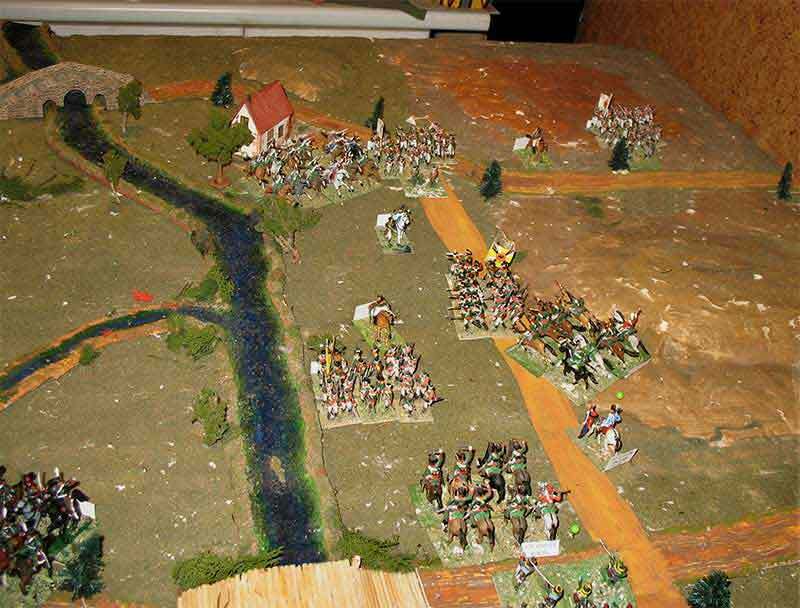 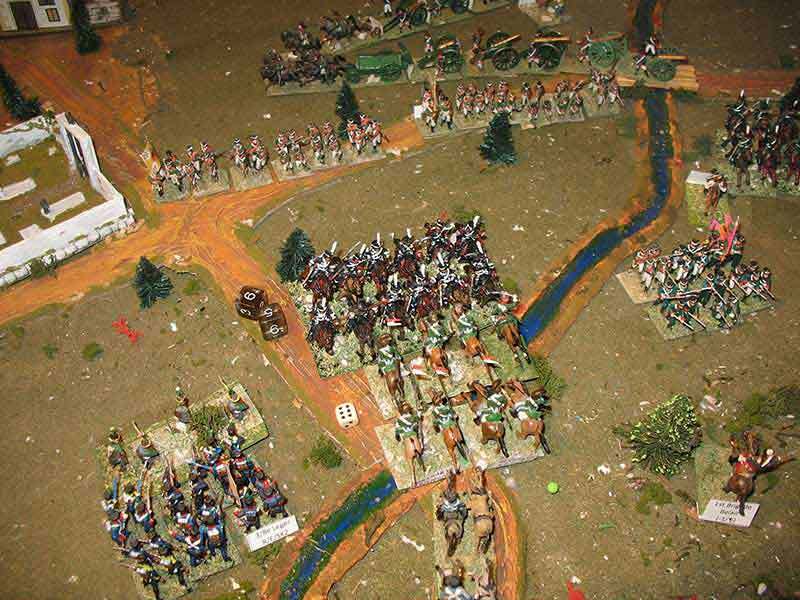 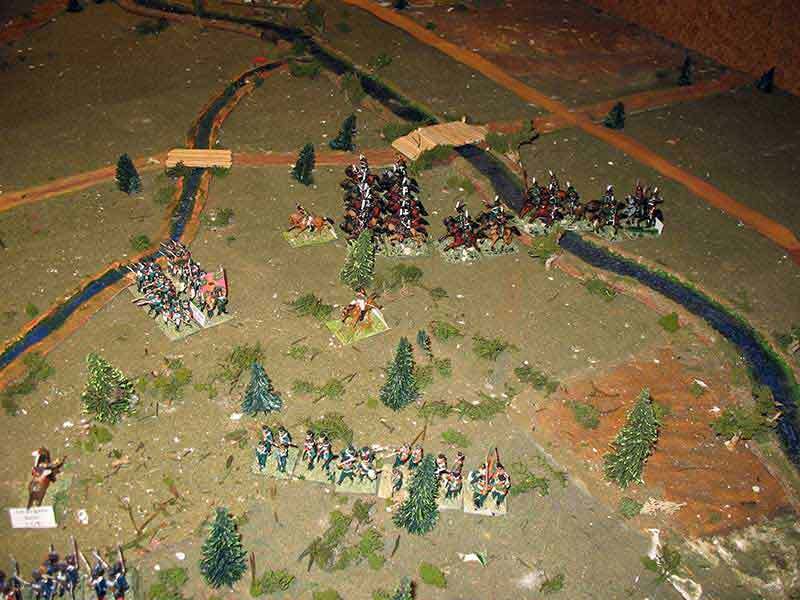 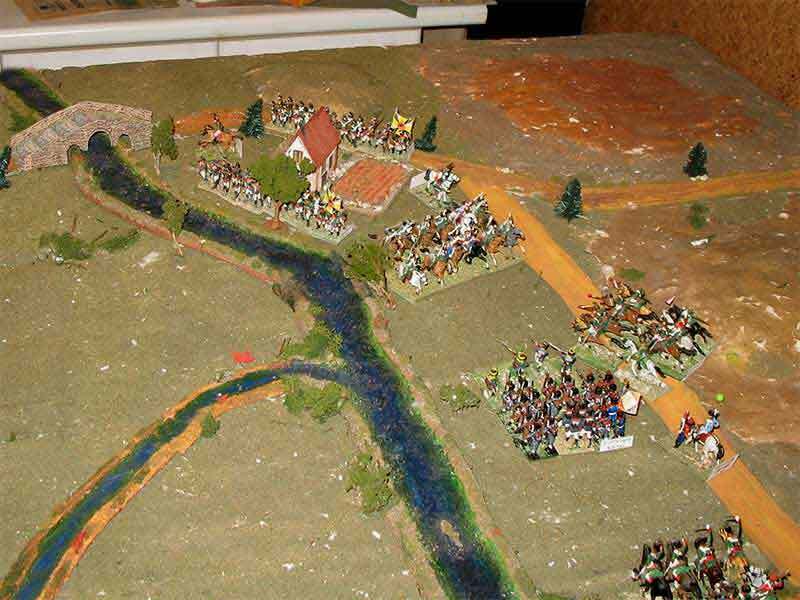 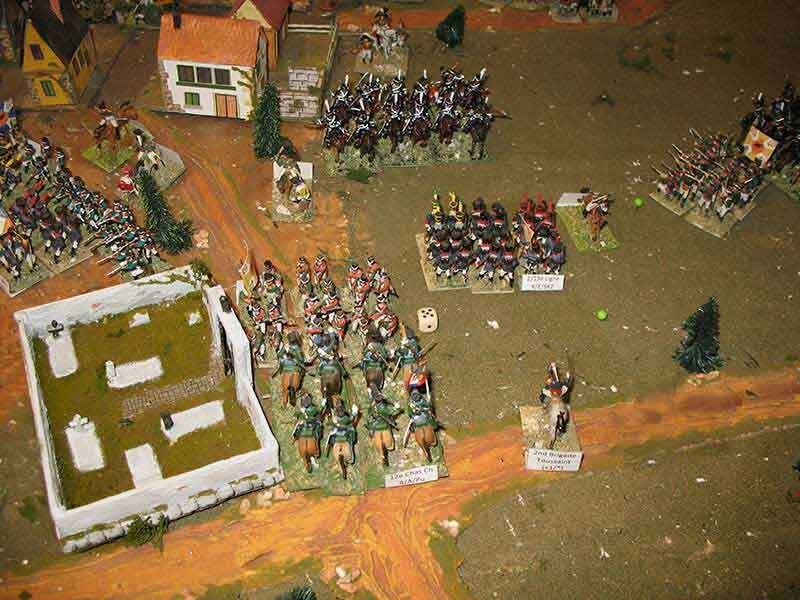 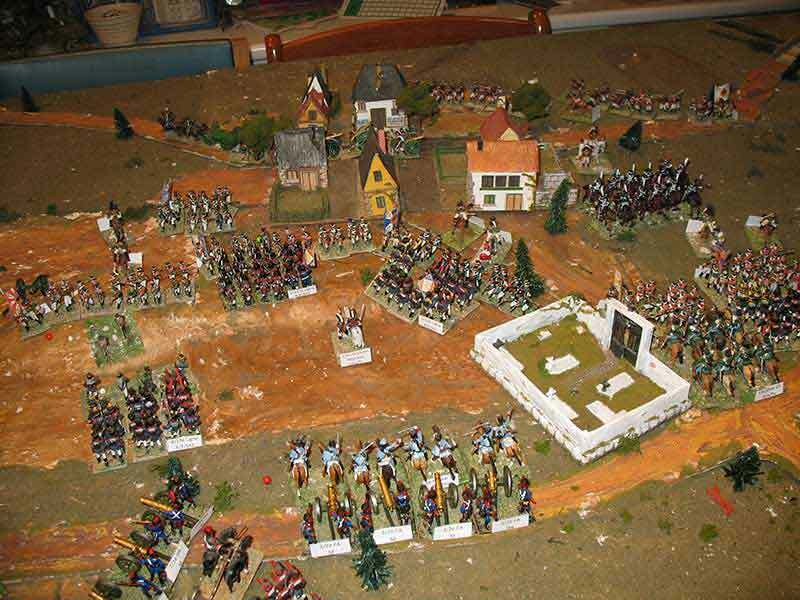 Additionally, the appearance of the Russian units (based on the dice), allowed Osteman-Sacken to deploy his forces in a way facilitating the defense, and thus the line of western hills at South of Brugerkint, become the actual focal point of the battlefield. 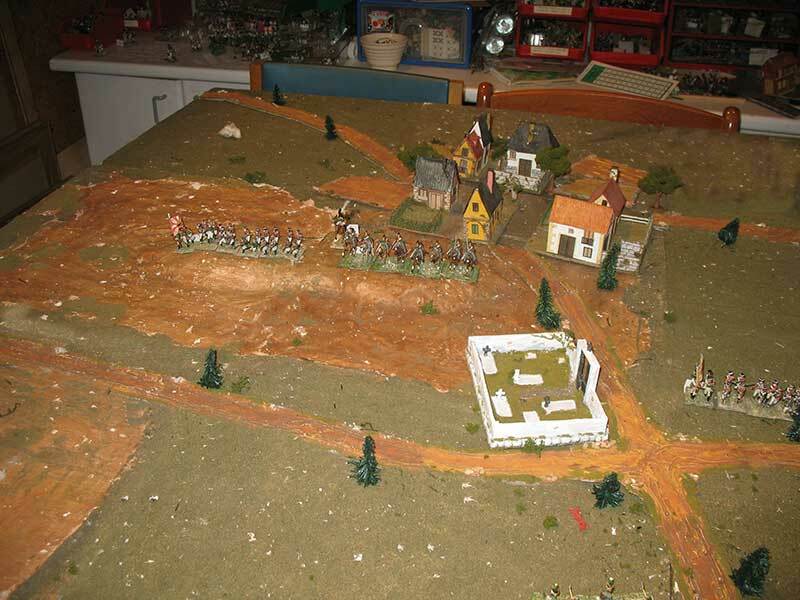 That hill line protected the only escaping route available to the Russians, i.e. 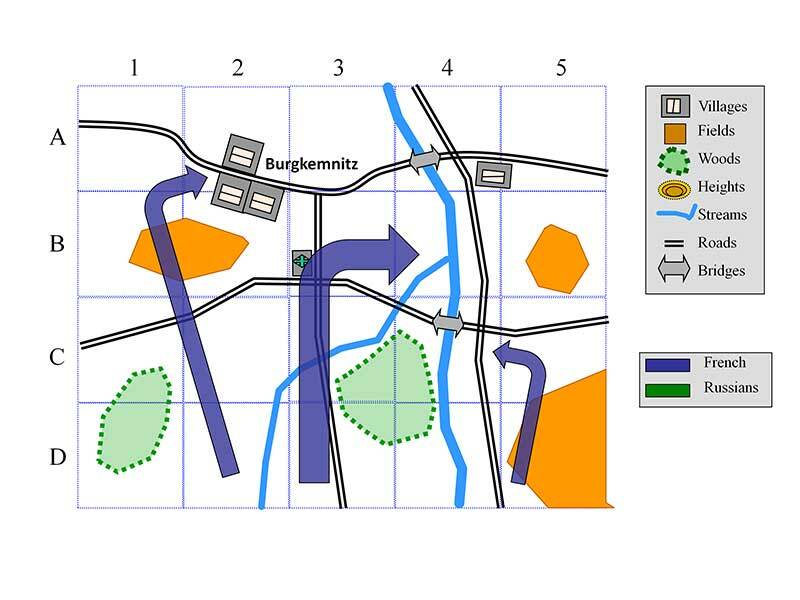 the road running through Burgkemnitz, since the other road was cut off by the French advance almost from the beginning of the fight. 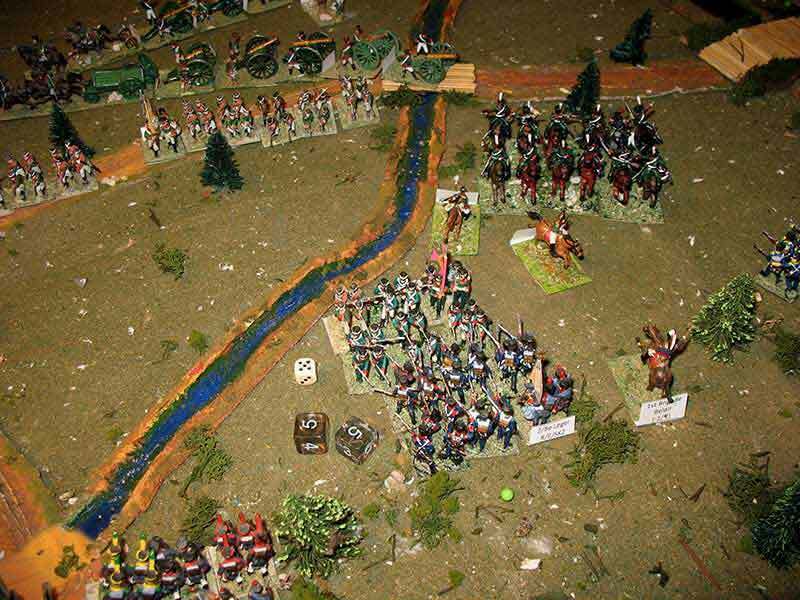 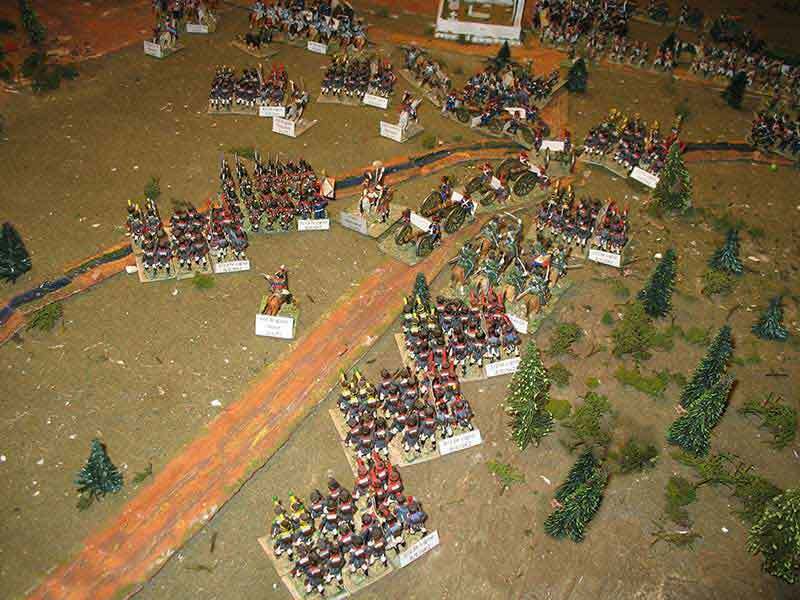 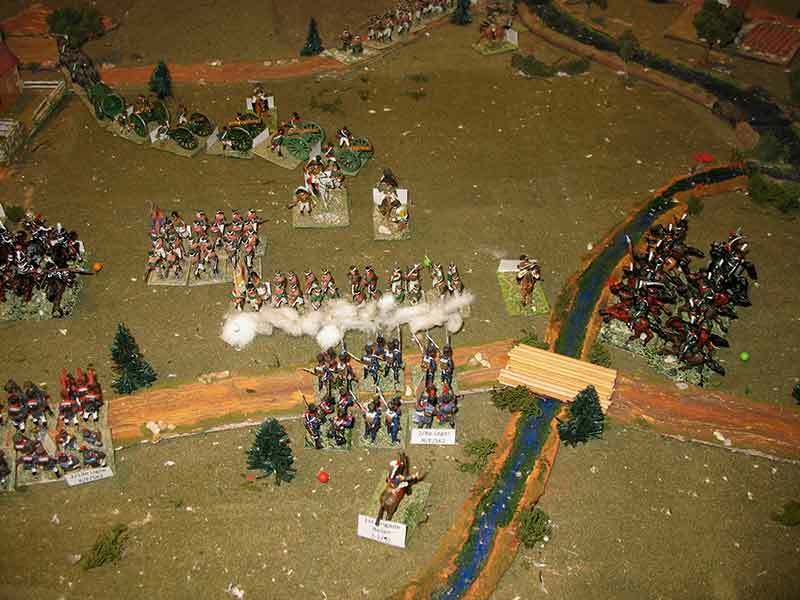 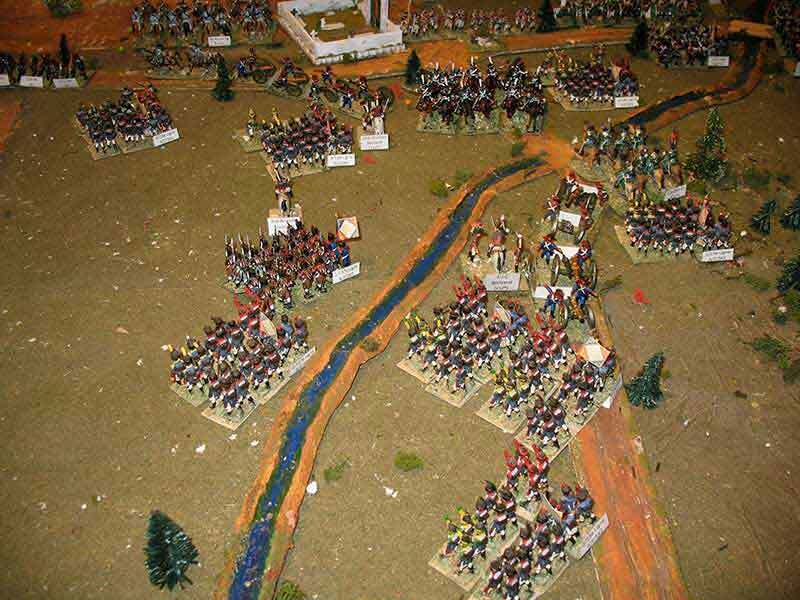 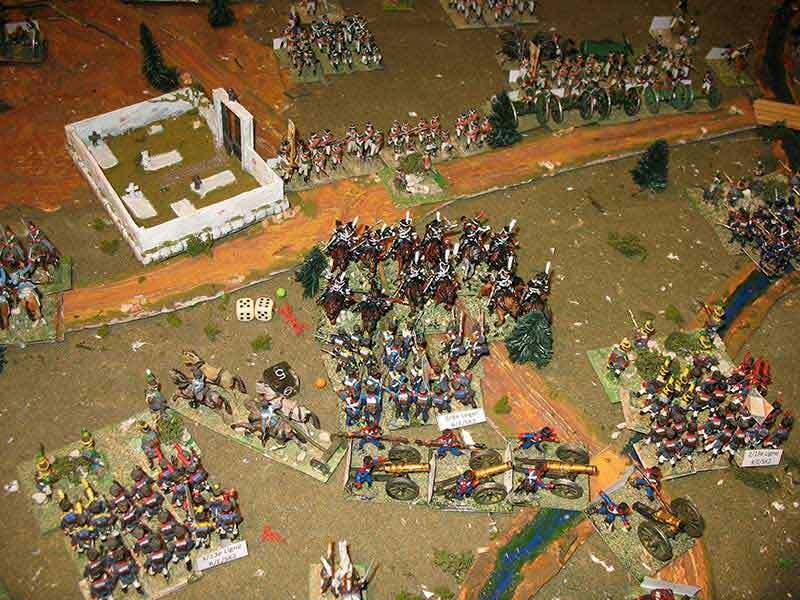 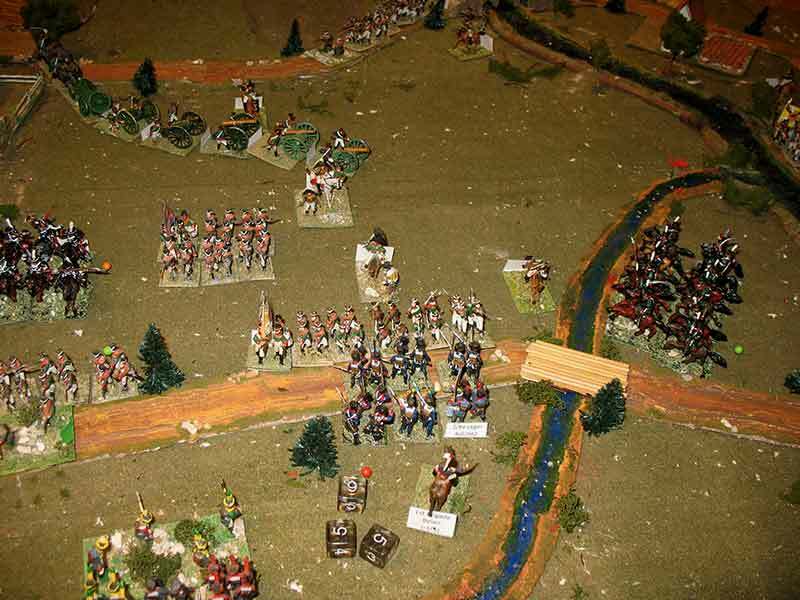 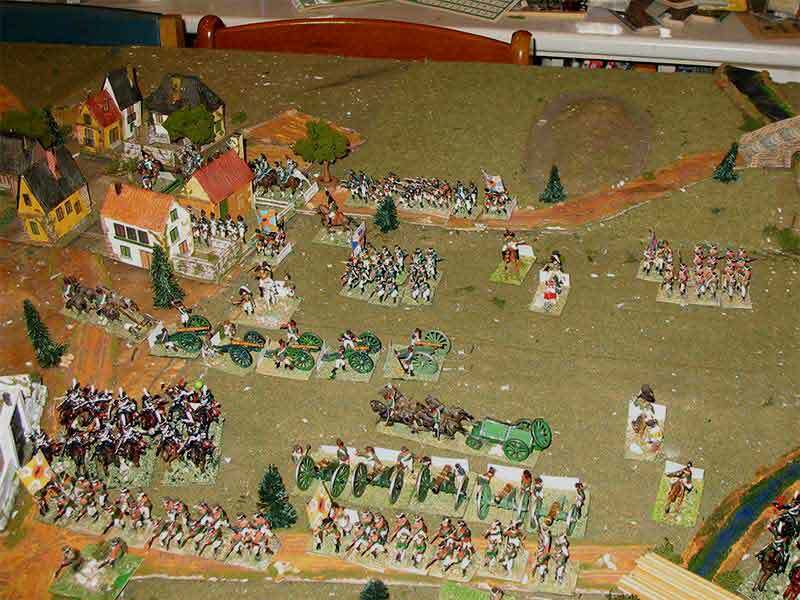 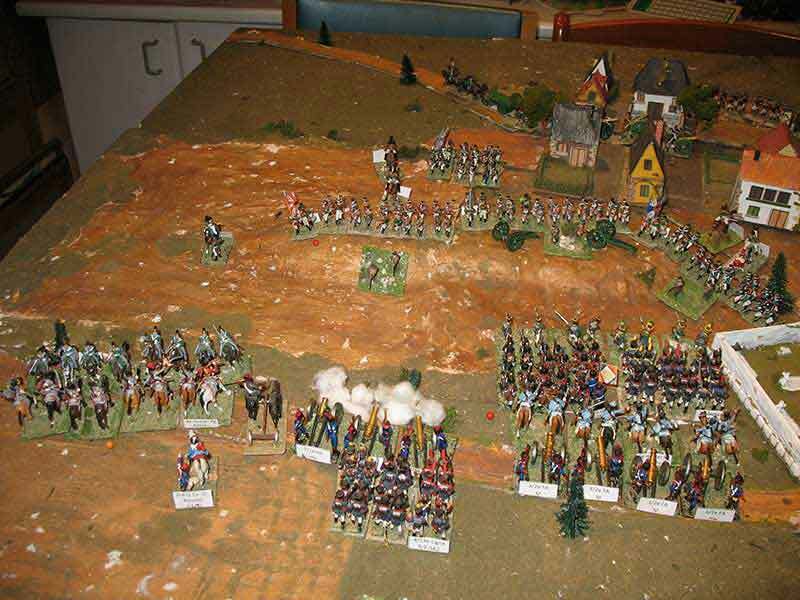 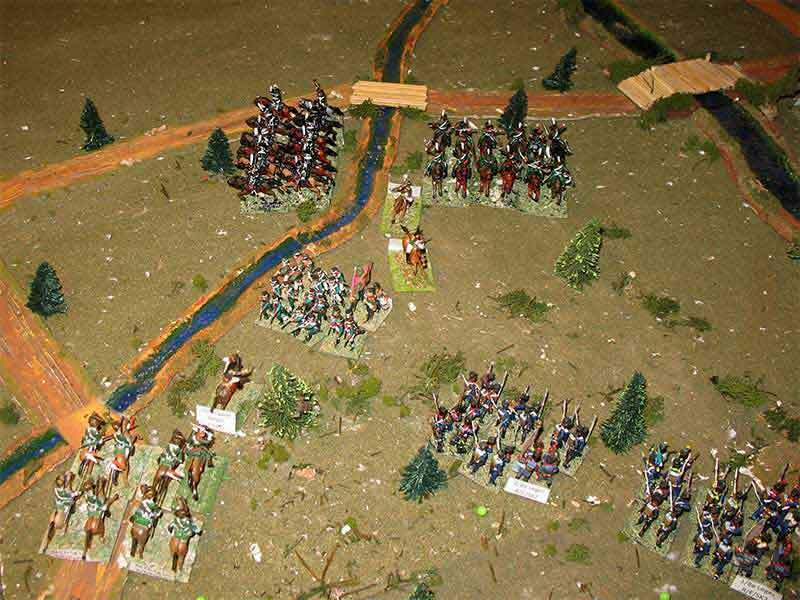 The French C-iC- realized its importance and left to their own devices to his right flank forces in a continuous and futile skirmishing with the Russian Cossacks and regular cavalry, which protected the withdrawal of the infantry units in that area. 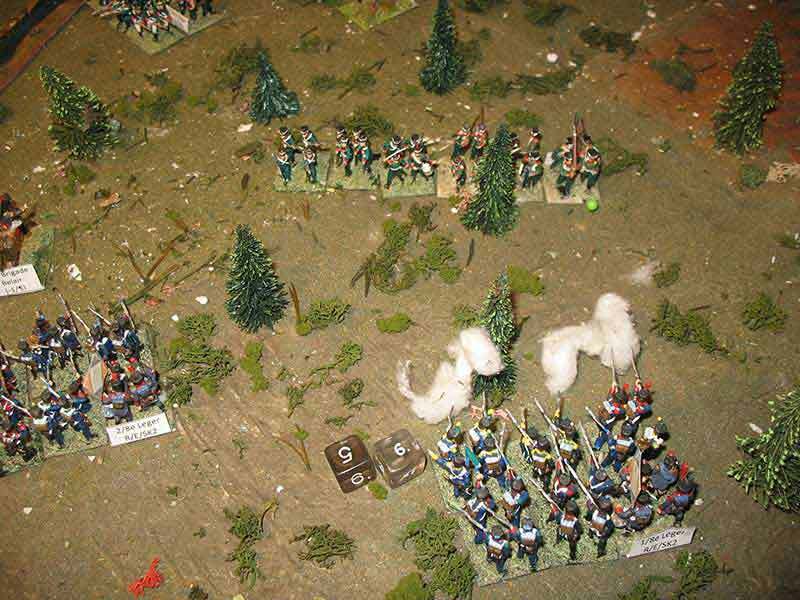 The French vanguard also had a secondary role in the central sector, and although they cleared the forest from Russian Jaegers, they suffered greatly at the hands of Russian units covering the exits of the forest. 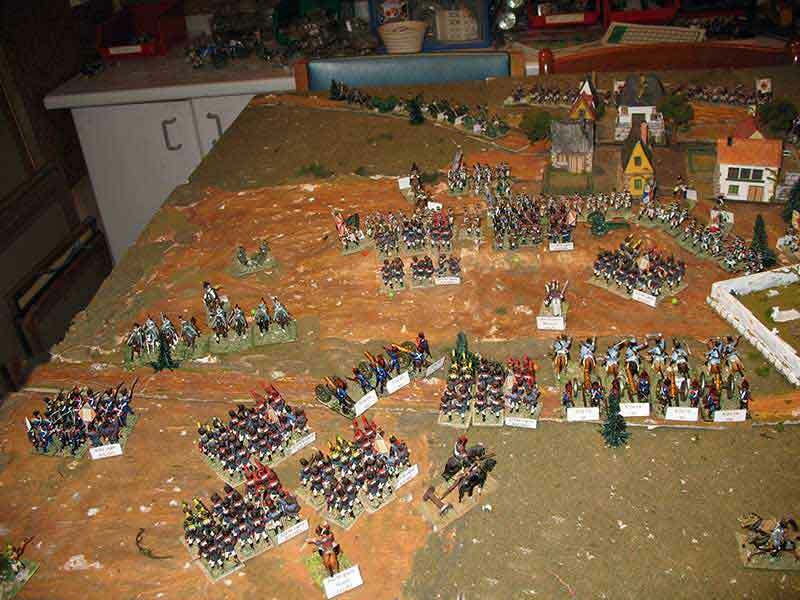 Actually, the French vanguard acted as a covering force of the French main attack. 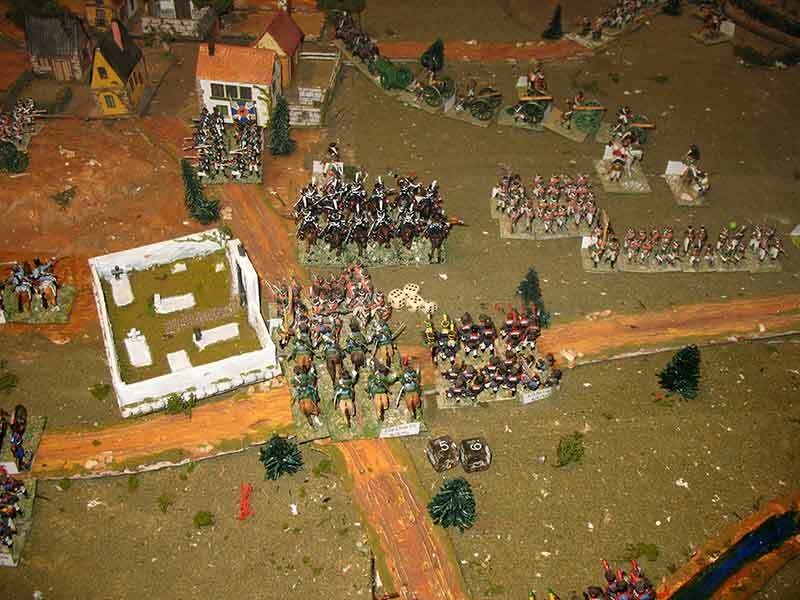 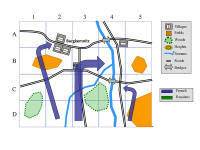 That main attack was launched in the western sector, where the bulk of the French forces inclined to the left. 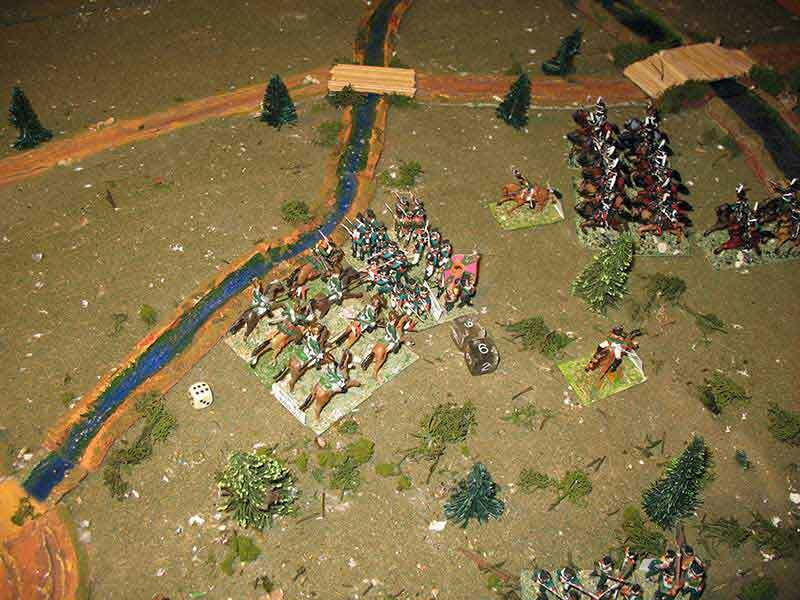 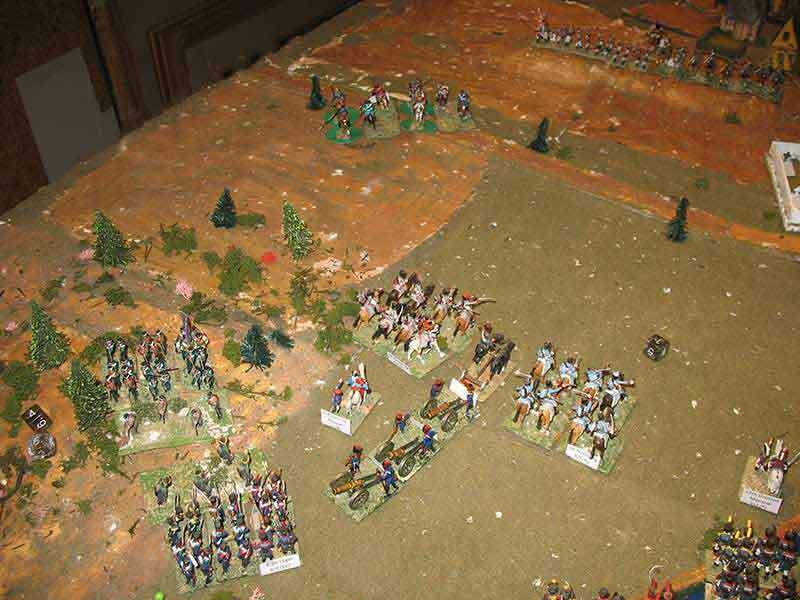 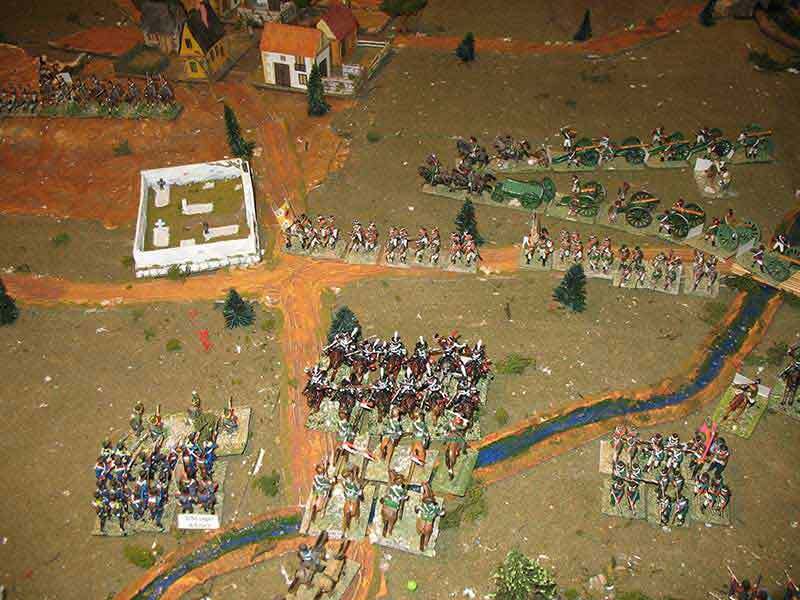 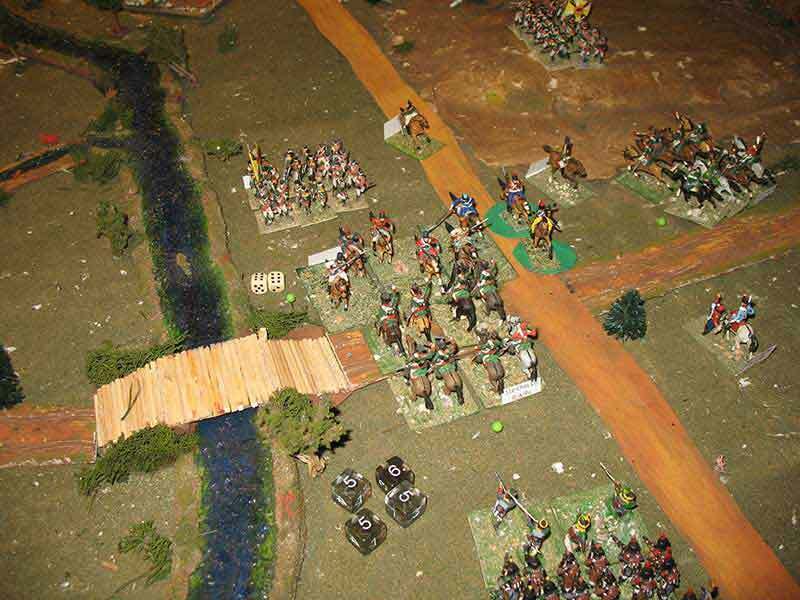 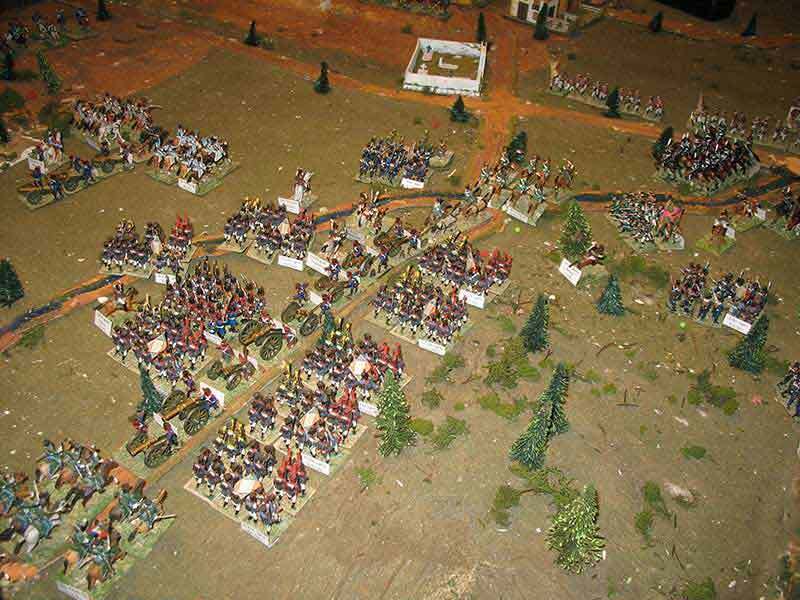 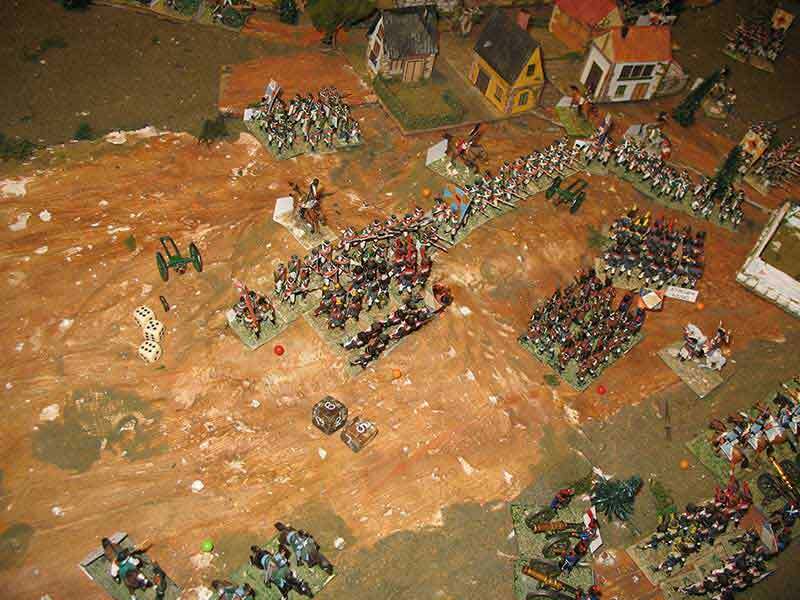 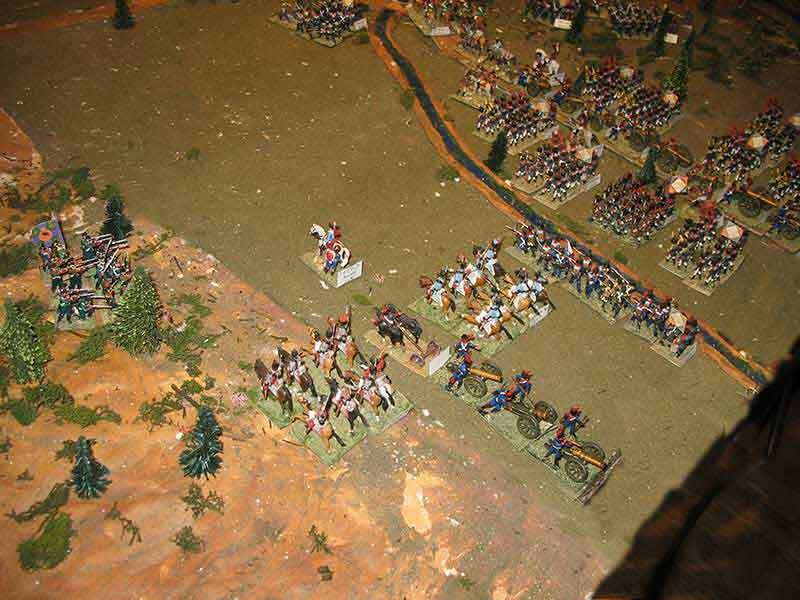 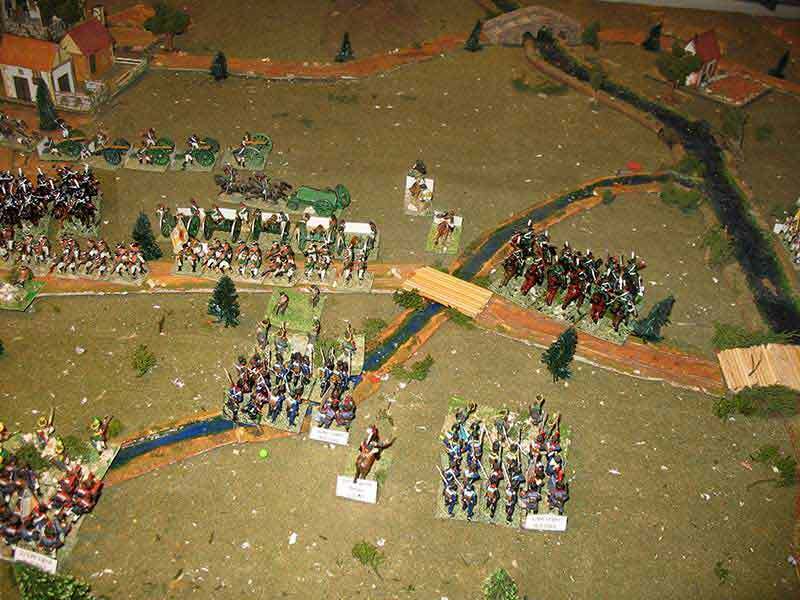 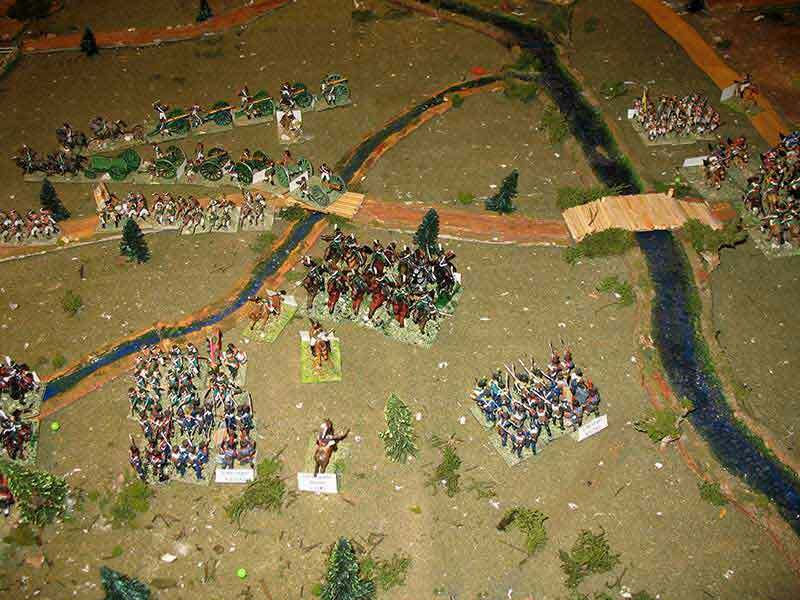 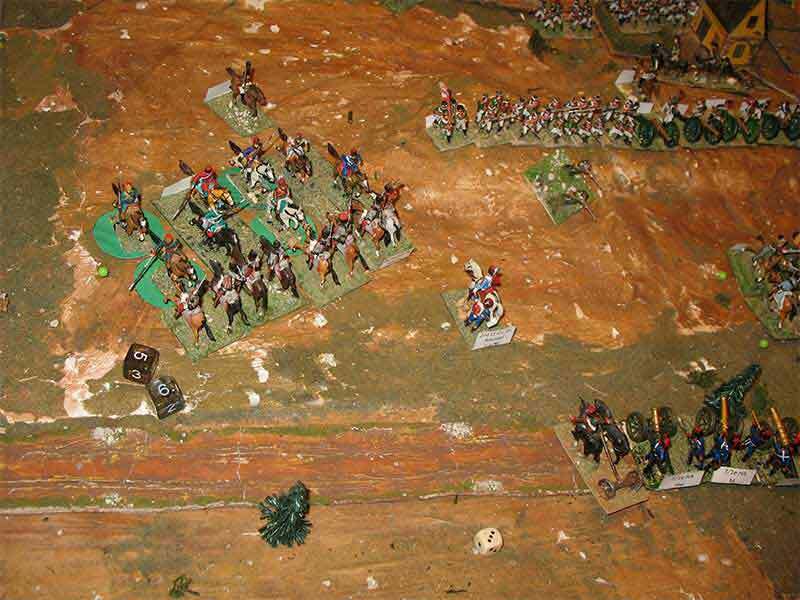 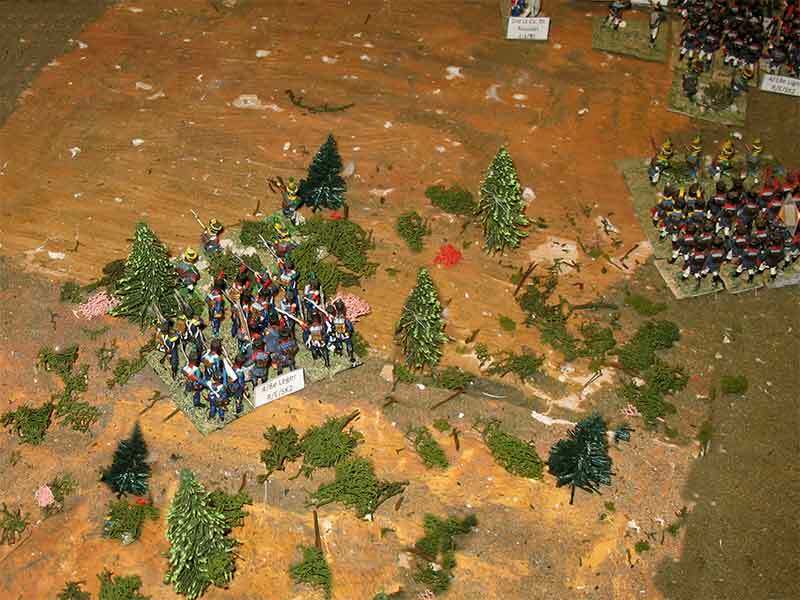 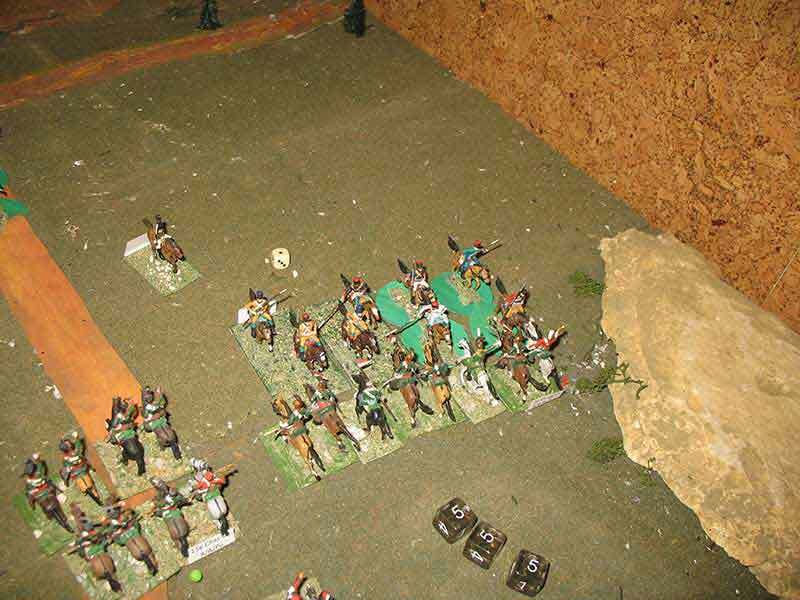 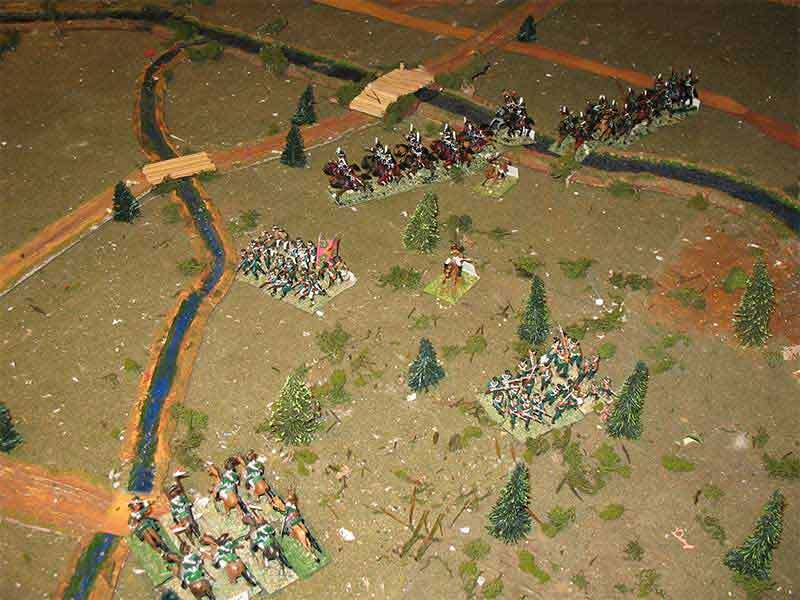 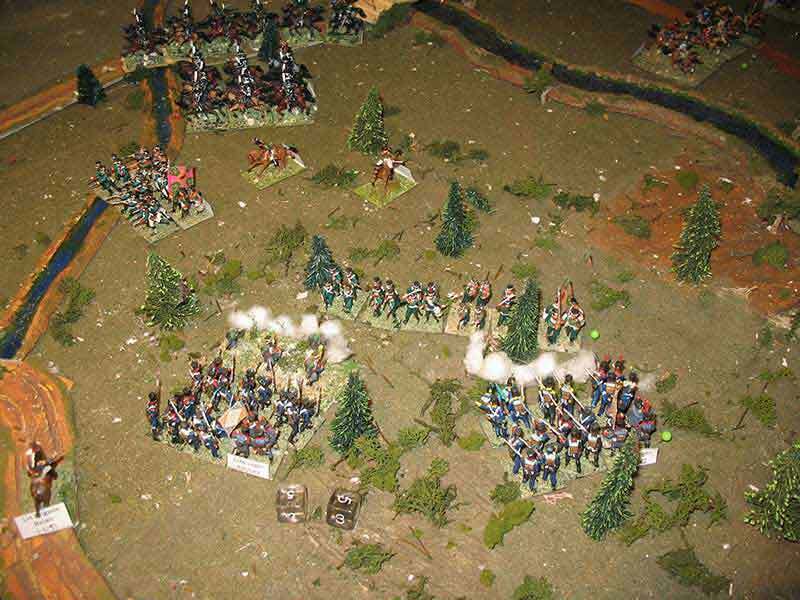 First the cavalry and then the infantry, advanced uphill against the defensive line formed by the Russian C-i-C, which also realized the importance of the position. 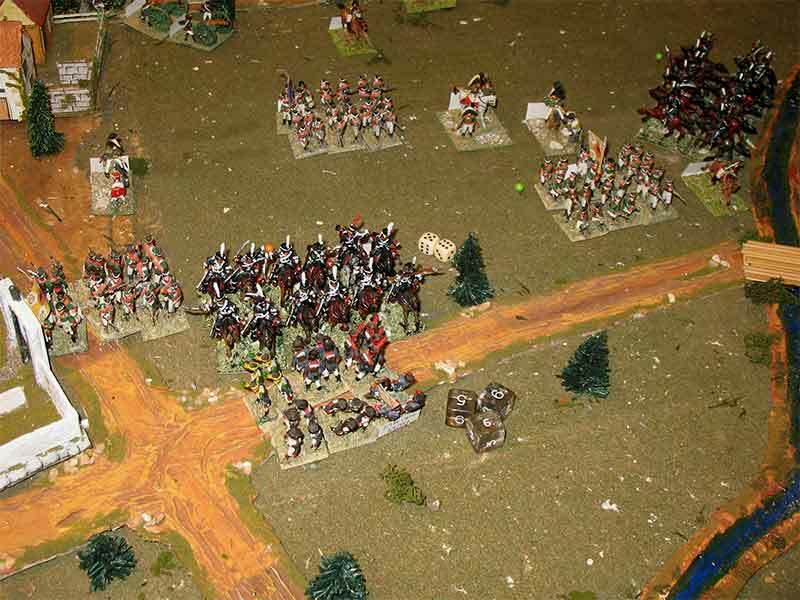 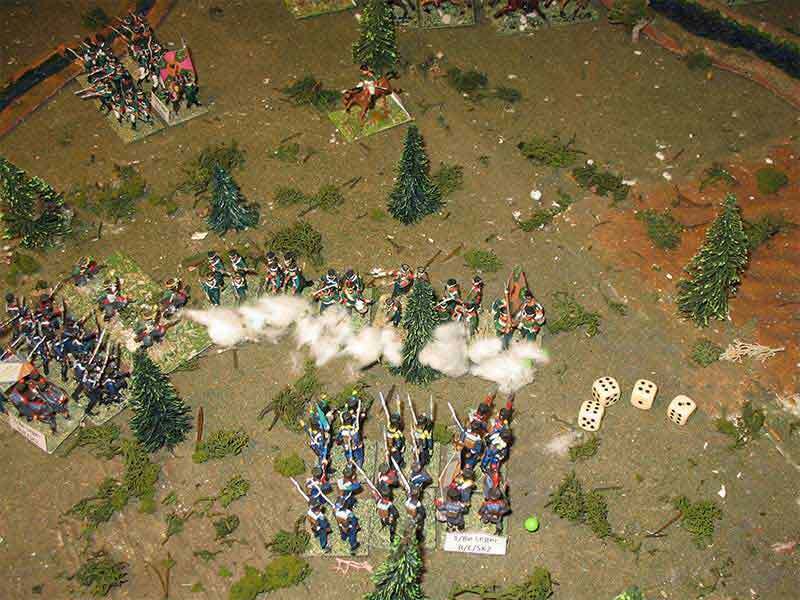 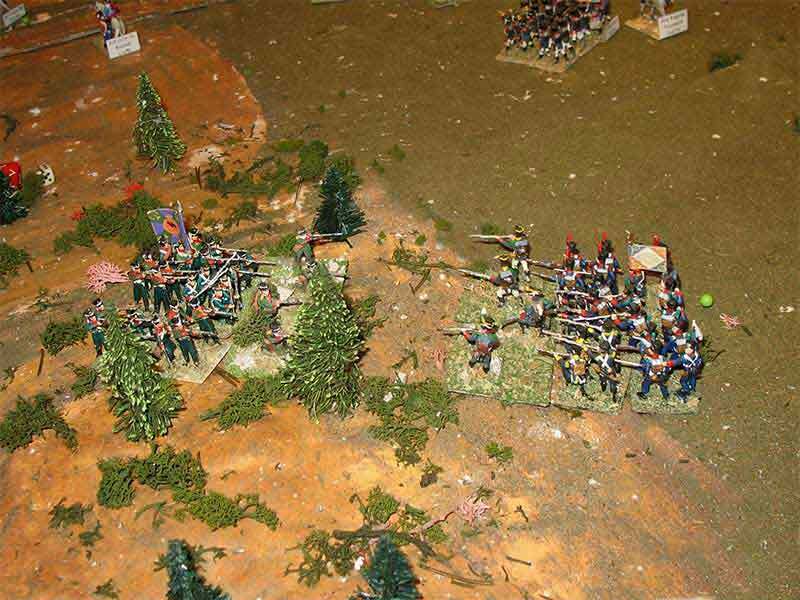 At last, the Russian units rejected several attacks of the French line infantry, which were left next to collapsing point. 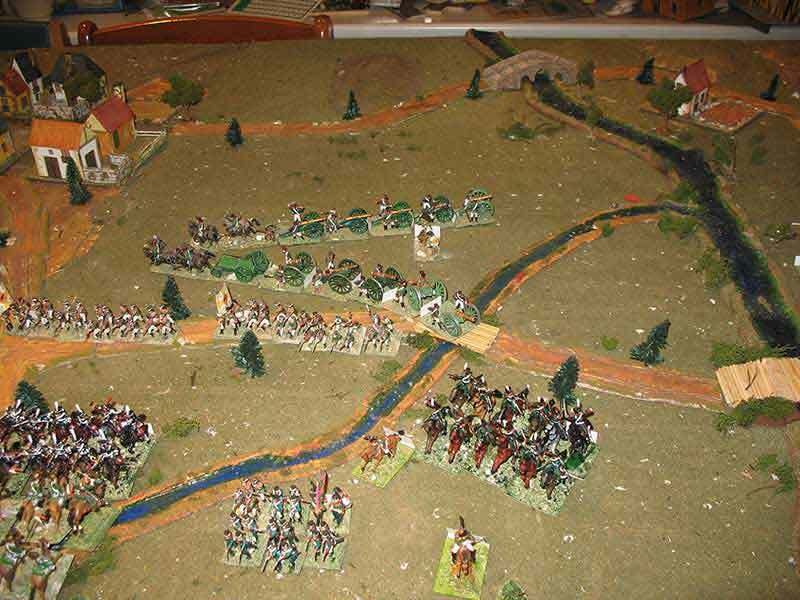 This fact was used by the Russian forces to follow their march westwards under the protection of their victorious infantry, because of the excessive time needed by Bertrand to mount another assault.